The new station was built on new baseboards, enabling us to continue using the old station while its replacement was being built. 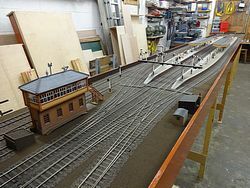 Some remodelling was required on the approach to the turntable from the station but the loco yard itself remained unchanged. 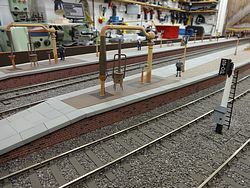 Likewise on the approach to the station from the circle, some remodelling was required but this was carried out as stage works between exhibitions. The new station has been built as a GWR station (the old station was SR) as this is more appropriate to the adjacent GWR loco yard. 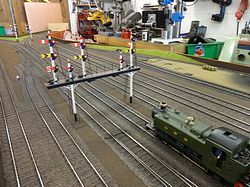 Full signalling with GWR lower quadrant signals has been provided and the main station panel has been renewed with a push button route setting panel to considerably simplify operation. 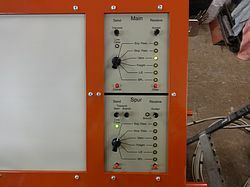 The diagram below shows the new push button route setting panel faceplate. 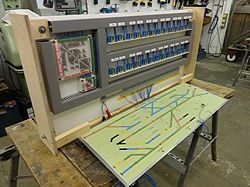 20th September 2017: The first three pictures show the new train speed controller console has been made ahead of schedule and mounted on the front of the interlocking cabinet. As we did not think we would have time available for this at this stage we were planning to use the old console for a few shows. 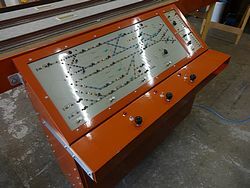 However this was not a very satisfactory proposition because the old console was wider than the interlocking cabinet and the control knobs did not line up with the appropriate route cancellation buttons on the panel (when a route is set on the panel the appropriate train speed controller is indicated by one of the route cancellation buttons). 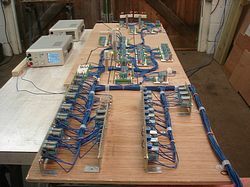 The opportunity has also been taken to renew the old circuit board controllers which by now are well over 20 years old. The wooden boarding around the platform starting signal gantry uprights have been finished and painted. Paving of the platforms is now finished as is the brick paving around the water columns. 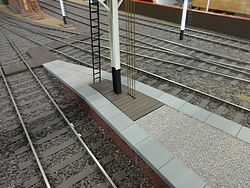 The non-paved areas of the platforms have been gravelled. 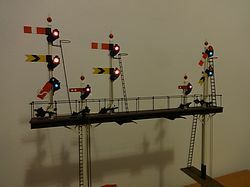 The illuminated Stop sign seen on the right protects the exit from the Loco Road. The three general views of the station show that the canopies are now finished. 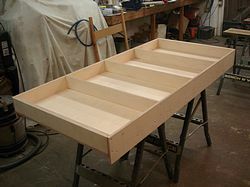 A thin plywood top was first glued in place on top of the ribs shown in the previous update. This provides a huge increase in the stiffness of the structure and should prevent it sagging or twisting in the future. The tops were then clad in plastic card with added rib detail. The valances as mentioned in the previous update are custom made laser cut plastic. 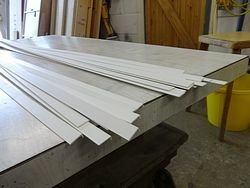 The barge boards and roof edging detail are fabricated from plastic strip. Holes have been drilled in the platforms for lamp posts, station name boards and people. 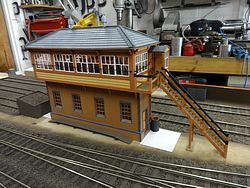 The completed signalbox is shown in position directly behind the complex pointwork on the approach to the station platforms. 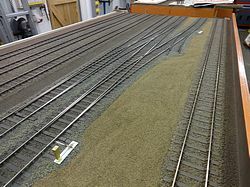 The baseboard surface between the ballasted track areas has been covered in a fine brown gravel. We are intending to introduce some grass banking in the wider area seen in the foreground. 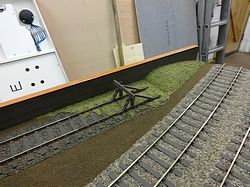 In the view of the loco yard end of the station, the wide brown area by the lamp hut will also receive some sort of scenic treatment in due course. 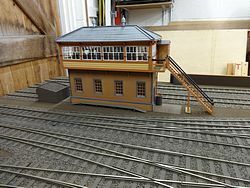 There will also be a ground frame/signalbox provided here to oversee operations in the loco yard. The end of the freight headshunt and adjacent loco siding seen in the left background have yet to be ballasted and be weathered with ash etc. There will also be a further water crane provided. Apart from this, the scenic work is now largely complete. 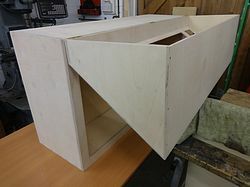 The final picture shows the transport box for the station canopies. 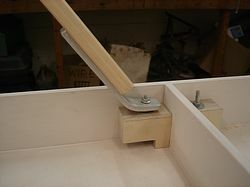 The canopies drop onto pegs on a supporting base and secured by a pair of thumb screws. 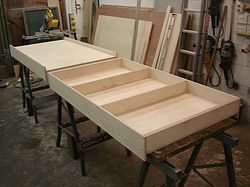 The bases then slide into slots in the ends of the box and are retained in position by the front door. 12th September 2017: With a number of work streams proceeding in parallel, rapid progress has been made recently. Firstly, the four remaining new station boards have all received their top coats of paint. 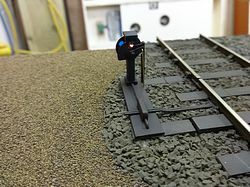 Platform lamps have been made and painted. Water columns have been made and mounted on drop in plates at the loco yard end of both platforms. 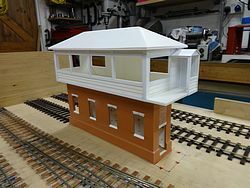 The next three pictures show the signal box (which is based loosely on Yarnton Junction) has been completed and painted and features a fully detailed interior complete with a 60 lever frame. Platform paving is also nearing completion. All the standard size slabs have been laid. 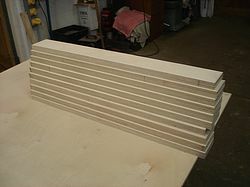 The required closure slabs have all been individually cut to size and numbered ready for painting and laying. 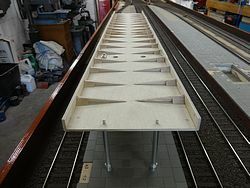 The next three pictures show a start has been made on construction of the platform canopies. Sub structures are being made out of plywood and balsa wood. 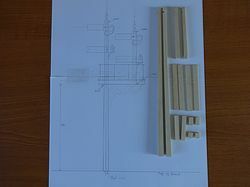 The next picture shows the first four (of twenty) aluminium supporting columns which have been turned up on the lathe. 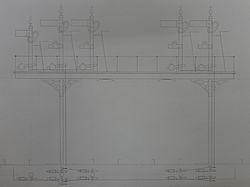 The columns at each end of the canopy feature locating pins which protrude though the underside of the sub structure. The intermediate columns will not be load bearing – blank ends will protrude through the oversize holes. This is deliberate to allow for uneven floors at the baseboard joint and will prevent the canopies rocking on high spots. Just visible about half way along the nearest canopy is a piece of laser cut plastic valance (custom made for us by York Modelmaking) temporarily taped into position for clearance checks before proceeding any further with the construction. The three illuminated Stop signs have been completed. Two are for the two long goods yard sidings and the one with the telephone box attached is for the exit road from the loco yard to allow loco crews to “ring out”. 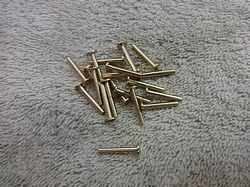 The signs are mounted on metal bases which drop into place on two locating pins on the baseboard. 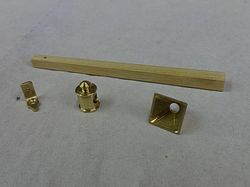 The large block of brass on the underside of the mounting plate provides stability and a “self righting” mechanism to allow the signs to withstand accidental knocks by people engaged in coupling and uncoupling operations in the goods yard. 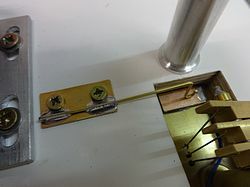 The fly lead with the jack plug provides the power for the lighting via two fine wires which run up the post from a small piece of PCB mounted on the bottom of the brass block. 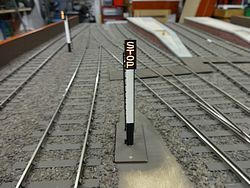 The two goods yard stop signs are shown in place. 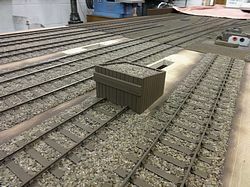 The base plate of the one in the foreground will receive the same ground cover treatment as the surrounding area in due course. 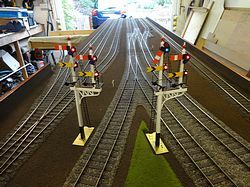 Finally, the remaining two shunt signals have been completed and installed. 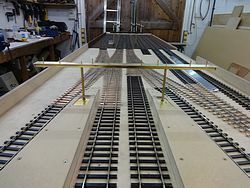 The picture shows the one that is in the long carriage siding at the front of the layout to control movements into platforms 1 and 2. 1st August 2017: The last of the new baseboards have been prepared for painting and the undercoat applied ready for the top coat. The next two pictures show the track being spray painted with sleeper grime. 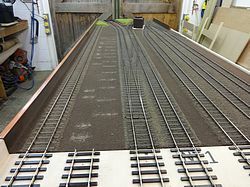 Ballasting follows the traditional practice of dry laying then securing the ballast in place using dilute PVA with a little washing up liquid to break the surface tension. 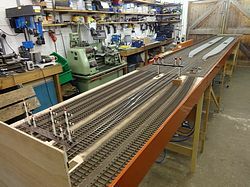 The wooden bearers visible in the foreground of the second ballasting picture are for a boarded foot crossing. 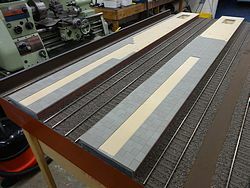 The next picture shows the hardboard platform tops have finally been screwed in place ready for the paving to be added. The boarded foot crossing referred to in the previous paragraph is just visible at the bottom of the picture. Lengths of plastic angle were ordered from a DIY store. 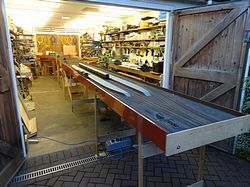 From this, a total of 19m of angle section for the coping stones was produced by accurately cutting off most of one side of the angle as seen in the foreground. A further 67m of flat strip was produced for the paving slabs. These were then cut to produce 900 coping stones and 2300 paving slabs! 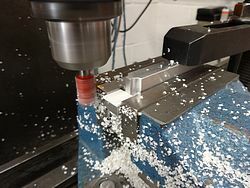 With 3200 cuts made at 1.5mm cut width, 4.8m was turned to swarf and a further 4.8m was turned to swarf when each slab was cleaned up on the mill by removing 0.75mm off each end! 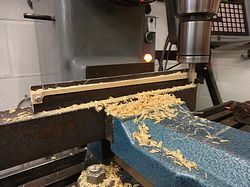 The next picture shows the mill being used to ensure accurately square ends (and a lot of swarf!) on a paving slab to ensure accurate fitting when being laid. All the slabs and coping stones have been spray painted in primer, then 4 subtly different shades of grey and finally sprayed with enamel matt varnish for protection before being glued down on the platform tops. 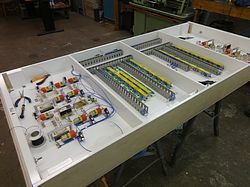 The next two pictures show removable aluminium inserts at the platform ends on which will be mounted the water cranes and associated fittings. The final picture shows yet more slabs being glued down. Since this picture was taken, all of the full slabs have now been glued. All that remains now is to make, paint and fix down about 100 closure slabs, then infill the unpaved areas with gravel. 6th June 2017: The wiring on New Station board number 2 has been completed. 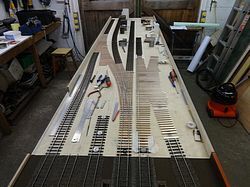 The next picture shows the wiring on the last of the New Station boards (number 1) virtually complete with just the wiring for the jumper cables to the turntable board to be connected to the terminal strips on the bottom right. 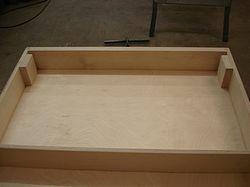 The third picture shows the hardboard tops have been made for the new platforms. These will be clad with individually cut and laid paving slabs in due course. 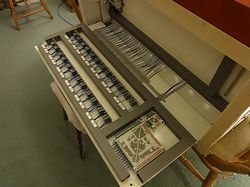 The next two pictures show the new (full) panel faceplate has been printed, laminated and all the switches, buttons and LEDs fitted and wired up. 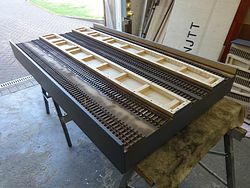 The timber top and bottom of the panel faceplate is temporary for handling purposes whilst wiring work is in progress. 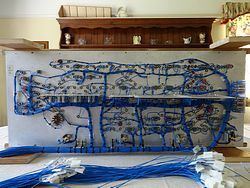 There are over 100 wires (seen in the foreground) to be terminated in the interlocking console. 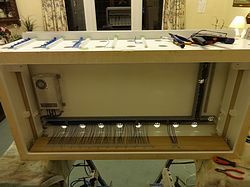 The next picture shows the panel faceplate installed in the interlocking console and the wires in the loom being terminated onto terminal blocks above the interlocking. 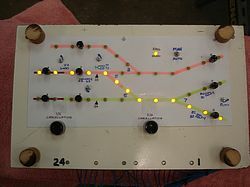 The picture of the finished panel shows routes set on the Up and Down main lines. 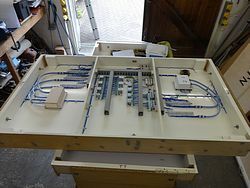 With the full panel in place, the whole of the interlocking is now in use. 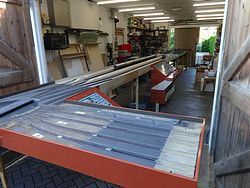 The train speed controllers seen in the foreground are the 20+ year old ones currently in use with the existing station and will be remain in use temporarily until new controllers and a new cabinet have been built. 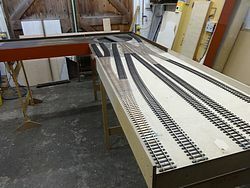 With all baseboard wiring now completed, the final three pictures show the Loco Yard with its new control panel, the New Station boards, the completed panel/interlocking and the first three Newchapel Town boards set up in the workshop for extensive testing. With the exception of a couple of minor bugs, which were quickly identified and corrected, it all worked first time! Completion of engineering works marks achievement of a major milestone and we are now on the home straight with the focus now shifting to completion of track ballasting, platforms and other scenic work. 25th April 2017: Some progress has been made with the new signalbox. The roof is now tiled and the first of the windows in the locking room is in place. 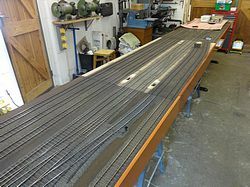 The new track on the station side of the Turntable board and the realigned goods loop line has been ballasted. 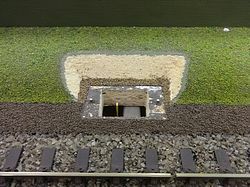 The two short sidings visible in the foreground and the baseboard in that area have been painted track colour only to make it less obvious that they do not match up with the track on the existing station board. 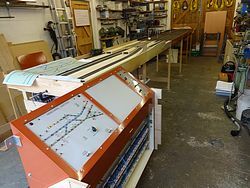 The mismatch of track is more obvious in the third and fourth pictures which show the Turntable board and new control panel set up for testing prior to the layout being exhibited at Doncaster, Tenterden and Leamington. We hope to keep the period in which the layout has to be shown like this to a minimum. This is driving us forward to completing the new station as soon as possible. 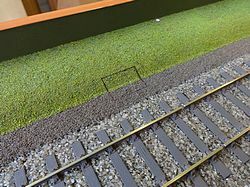 As is our practice, to minimise the risk of damage when taking the layout to shows, a custom made transport box has been made for the new loco yard panel. A new sleeper-built buffer stop for the end of Number 1 siding in the goods yard has been made and awaits painting. 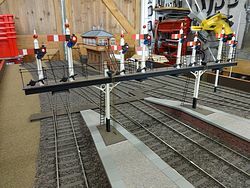 In the same way that the buffer stop at the end of the short carriage siding seen in the foreground protects a signal gantry from rough shunts, the new buffer stop will protect the new signalbox which will be located immediately beyond. The next two pictures show platform construction has been started with the side walls. 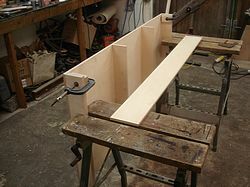 The curved portions are formed by cutting slots in the rear face allowing the timber to be bent as required to ensure proper clearances. The length of the new platforms which will all accommodate eight coach trains is apparent in the second of these two pictures. This was one of the main objectives for the rebuilt station as the existing one has two long and two short platform faces. 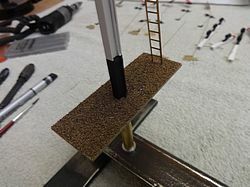 The structure for the steps down from each platform into the imaginary subway which leads to the (un-modelled) station building has been made. The final picture shows “false floors” being inserted between the side walls. These sit 5 millimetres below the wooden platform tops which have yet to be made. 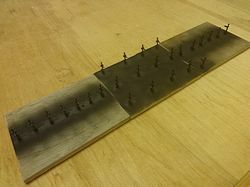 The purpose of the false floor is to provide a second locating point for the pins which we insert in the legs of figures to ensure that they stand upright. This also applies to other scenic fittings such as lamp posts, station name boards and canopy uprights. 25th January 2017: The operating mechanisms for the platform Starter signal gantry have been fabricated and installed together with the motors as per the previous signals installed as part of this project. 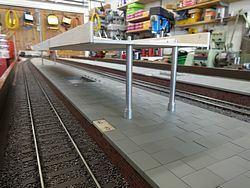 The second picture shows the finished gantry in place on the new station board which has been set up with the two adjacent boards for testing the opposing locking between the signal gantries. 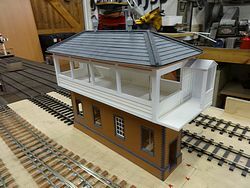 The next two pictures show that, in addition to all the engineering work that has been going on, some progress has also been made with construction of the new signal box. 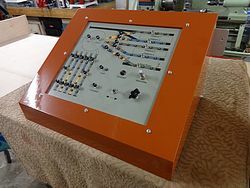 The next two pictures show front and rear views of the Turntable Control Panel faceplate with all the buttons, switches and LEDs in place. 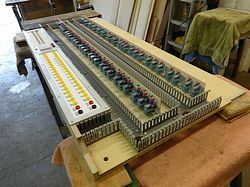 The wooden dowels seen protruding from the front allow the panel to be placed face down for wiring work without risking damage to the faceplate or components mounted on it. 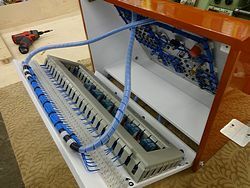 The faceplate wiring is now complete and connected via an umbilical cord to the relay units mounted on the baseplate of the control panel console. 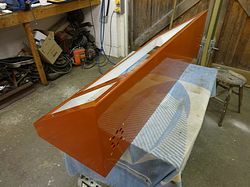 The next two panels show the TT panel console has been painted and the panel faceplate has been installed. 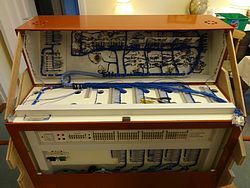 The jumper cables and plug couplers which connect the control console to the layout stow away in a recess in the rear of the console for protection during transport. 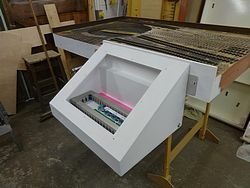 Finally the console is seen resting on its back with the baseplate hinged to the open position to allow access to the inside for maintenance purposes. 14th December 2016: Normal service has been resumed! The first two pictures show the track laying on these two boards is now complete which means a major milestone has been reached - all the new track for the new station is finished!! 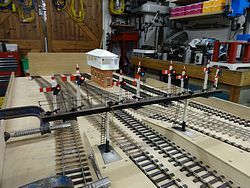 It can be seen that the new scissors crossover not only provides direct access to the turntable from platforms 1 and 2 but also provides a loco head shunt to enable run rounds to take place in these platforms without the loco having to go onto the turntable. 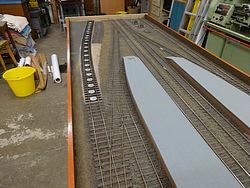 The third picture shows the goods loop line on the old station board has been slewed to the final alignment of this approach to the turntable. This will allow us to continue to exhibit the layout with the old station until the new station is completed. 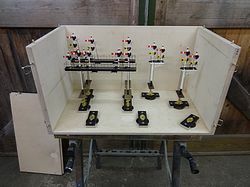 The next two pictures show the cabinet for the new turntable control panel has been built and mounting brackets fabricated. 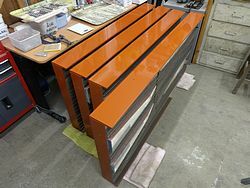 The next two pictures show the cabinet has been undercoated and a start made on the internal wiring. Finally, construction and wiring of the new platform starter gantry is complete and there is only the painting of handrails and ladders to be done. 31st October 2016: Apologies for the delay to this update. This is due to other commitments and also IT problems which have now been resolved. 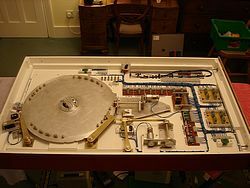 The first picture shows the top of the turntable board before the existing track was removed. 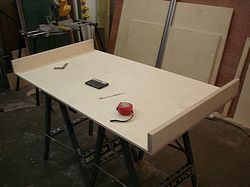 The white rectangle visible on the left hand side is where the existing control panel was removed and the opening in the baseboard surface filled in. 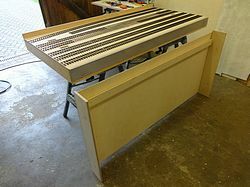 The next two pictures show the turntable board attached to the new station board for track laying. 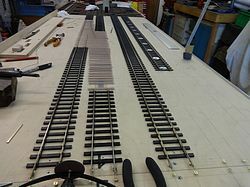 The track and pointwork under construction is the goods loop/head shunt and new loco siding (where the old control panel was mounted) together with the goods loop connection to the turntable and the connections from platforms 3 and 4. 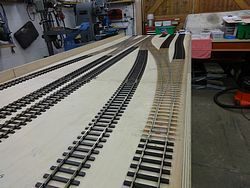 The fourth picture shows this trackwork completed. 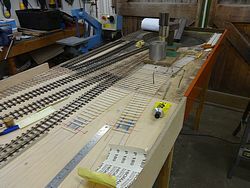 The next picture shows a start being made on the new scissors crossover for platforms 1 and 2. The balsa packing strips have been laid out and glued down. The final three pictures show this trackwork progressing towards completion. 30th September 2016: Apologies for the delay to this update. This is due to other commitments and also IT problems which have now been resolved. 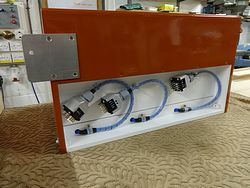 The first two pictures show the wiring on the second new station board has been completed and the jumper cables and plug couplers together with their stowage pockets for transport are all finished. 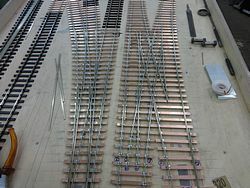 The pink paper and tape seen at the top of the second picture show where some of the signal operating motors for the platform starter signal gantry will be mounted. 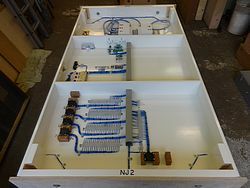 All the protective cover boards on this board have also been completed. The next two pictures show the third new station board has also been fully wired and the jumper cables completed. 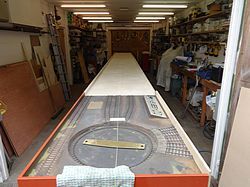 Now that we have a break between exhibition commitments (our next show is not until February), work has started on the modifications required on the underside of the turntable board. 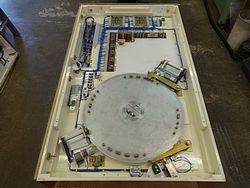 The first picture of this board shows the cover board removed and the turntable mechanism and relay units as they were before work started. 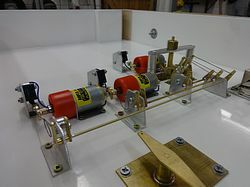 The next picture shows the redesigned, more compact turntable drive mechanism completed. This has freed up space for the new point operating mechanisms for the points on the approach to the turntable. Finally, after a slight redesign of the signal box, a new start has been made on the brick base. 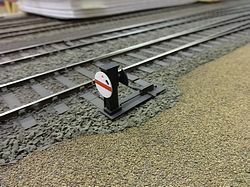 25th August 2016: Whilst work has been progressing on the new baseboards and signal gantry, a start has also been made on the first of the production versions of the three Great Western “Stop” signs required at the exit from the two main goods yard sidings and from the Loco Yard onto the freight loop behind the main station. 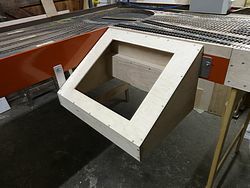 The first picture shows the internal milling required to form the large housing for the “Stop” legend. 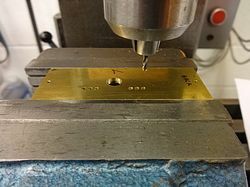 The second picture shows the milling completed and the housing ready to be separated from the brass bar from which it has been machined. 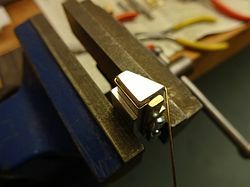 The next picture shows the first housing clamped to its lamp casing prior to soldering. As with the Limit of Shunt sign made previously, these Stop signs are being made entirely from brass for durability. 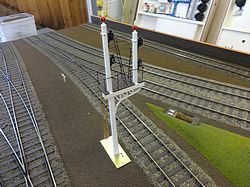 Meanwhile the new signal gantry has also progressed with the feed wiring for the signal lamps added. 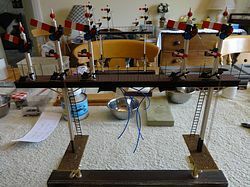 The fifth picture shows the completed dolls glued in place and the wire rodding and cranks to operate the signal arms have also been completed. 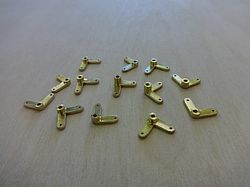 The next picture shows a close up of the lower operating cranks which have been machined from brass with large counterweights to overcome the inertia of the operating wire runs and ensure the signal arms return to the On position. 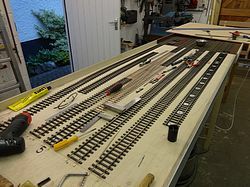 The next picture shows wiring well under way on one of the next two station boards. As explained in the previous post and can be seen here, there is a large amount of equipment under this board! 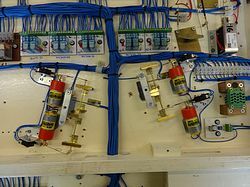 This wiring is now complete (although the signal operating mechanisms have yet to be added) and the next two pictures show the two new station boards set up with the adjacent three boards as far as the junction for testing with the interlocking. With the exception of one minor design oversight (a missing track feed which was quickly rectified) it all worked first time. Finally, a taste of things to come with a Great Western Mogul waiting for the road from platform 1. 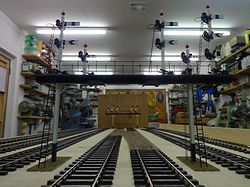 The gantry is now nearing completion – mainly hand rails, ladders for the dolls and lamp return wiring to go. 10th July 2016: Work has continued on the platform starter signal gantry. White metal brackets have been added together with ladders. 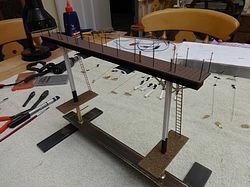 The base plates have been drilled for the signal operating wires and a feed wire for the lighting circuit has been run up the inside of one of the girder uprights. 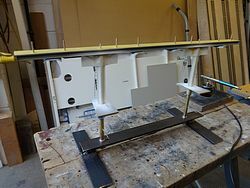 After having been primed and painted white, the fourth picture shows the gantry masked up ready for painting of the black work. With painting completed the whole structure has been sprayed with a matt varnish. The wood decking has been painted and fixed in place. 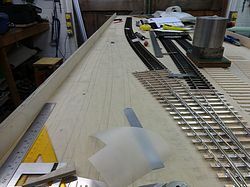 While this has been going on, some considerable time has been spent on wiring design for the board with the station throat point work on it. 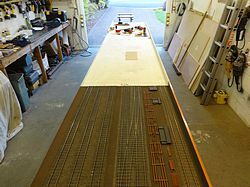 A start has now been made on laying out equipment under this board. 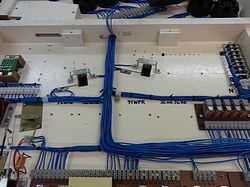 To the right hand end can be seen a row of 20 way sockets for cable jumpers to the next board together with power supply fuse bases and busbars. 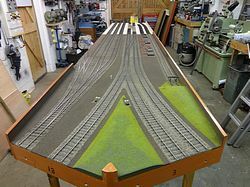 The next bay to the left shows two point operating mechanisms in place. The pink tape markings identify where the signal operating mechanisms for the signal gantry will be positioned. 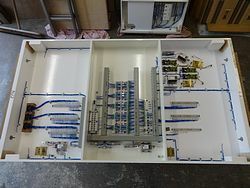 The next bay to the left shows the relay units which were made previously roughly laid out together with plastic trunking for the wiring. 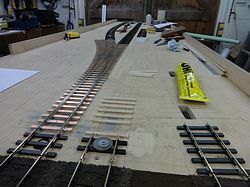 The four point operating mechanisms for the scissors crossover together with the operating mechanism for the shunt signal at the end of the long siding have been installed in the bay at the left hand end of the board. 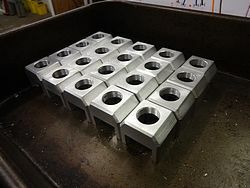 Finally, the last batch of plug coupler covers has been machined from aluminium. These are considerably more durable and cheaper than the proprietary plastic covers. 14th April 2016: Now that track laying has extended into the platform area this has allowed the location and profile of the platform ramps to be finalised. The first picture shows the battens in place for the side walls of platforms 3 and 4. 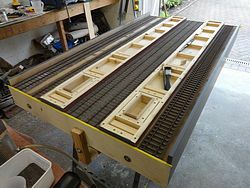 The second picture shows the platform top in place, having been set to gauge clearance by use of the specially made jig seen on the right. Side throw clearances along the curved portions are also checked using a bogie coach. 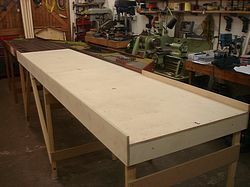 The third picture shows both platform structures completed as far as the baseboard joint. Brickwork, paving and coping stones will be added in due course. 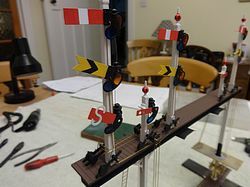 The cutouts seen at the top of the ramp ends are for the baseplates for the signal gantry which will carry the Platform Starter signals. 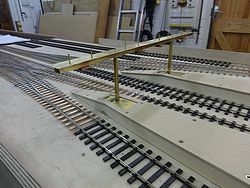 The baseplates have been accurately machined from brass and bent to match the angle of the platform ramps to fit the cutouts as seen first in close up then a general view showing both baseplates in position with some coping stones laid temporarily in position. 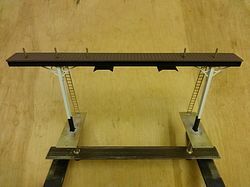 It can be seen that the gantry (which has to be removable for transport of the layout) will drop into position between the coping stones along each platform edge. The next picture shows the design of the new gantry which is even longer than the two already completed and recently brought into use on the approach to the station. 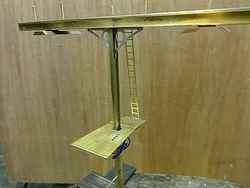 The basic structure of the gantry, fabricated from brass strip and angle with machined brass pins to locate the dolls as per the previous gantries (one of which can be seen in the background) is now largely complete. Also the scissors crossover can be seen finished in the background of this photo. The final picture shows the smoke deflectors in position. 9th February 2016: The first picture shows more plain line track added in one of the platform lines and one of the goods yard sidings. 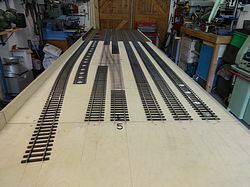 The second picture shows the first two crossing noses and their wing rails have been completed in the scissors crossover whilst the next picture shows the crossing noses and wing rails for the points into the goods yard siding have also been added. The fourth picture shows the fixed diamond at the heart of the scissors crossover has been completed and work progressing well with the remainder of the crossing noses. 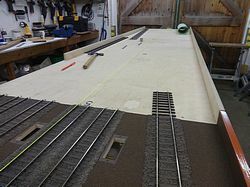 Now that all the tracks crossing the baseboard joint to the existing layout are in place this board has been removed, the new boards moved along the workshop and the final two new boards erected. This view starts to give a good idea of what the new station approach will look like. 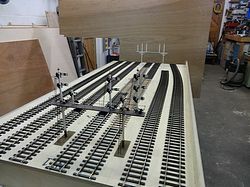 The points connecting the goods reception line to two of the goods yard sidings are now complete. 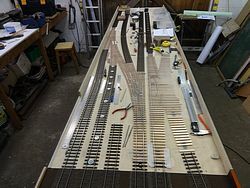 Meanwhile, all the crossing noses and wing rails are now in place on the scissors crossover together with the first of the switch rails (top right set of points). Note also the single switch rail trap point near the bottom right hand set of points. Finally plain line track is advancing through the platform area. The line reaching closest to the camera is for platform number 3. 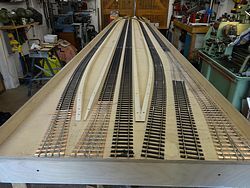 6th January 2016: Over the Christmas and New Year holiday period a start has been made on track laying on two of the new station baseboards. 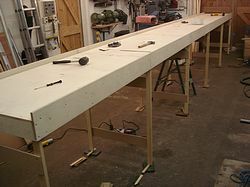 The boards were erected in the workshop together with the recently completed board in order to fix the track alignment over the joints. 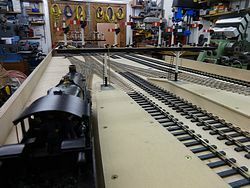 The next picture shows a string line in place on the alignment of one of the rails on the Down Main line to provide a datum for setting out the alignment of all the tracks. 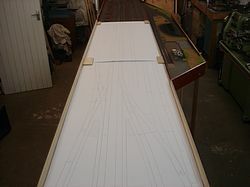 The whole of the track layout on these boards has been drawn out full size on the baseboard surface - it is just possible to see the first of the pencil lines for this. 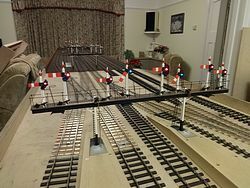 The third picture shows the tandem turnout (which provides access to platform 4 and the freight reception road) partially completed with the three crossings and wing rails in place. To the right can be seen the guide lines for the scissors crossover which is at the end of platforms 1 and 2. 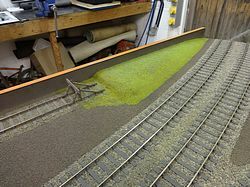 The next two pictures show the tandem turnout completed and marking out of the freight reception road and connections to two of the goods yard sidings in progress. 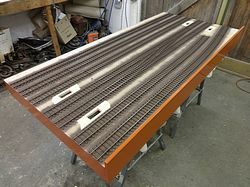 The pointwork is being constructed using our standard method of rail soldered onto copperclad sleepers which are packed up on balsa wood strip to bring the height up to match the plastic sleepers on the plain line Peco track. 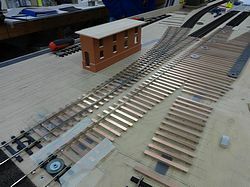 The balsa strips and copper clad sleepers for the scissors crossover are shown being glued down using Uhu and weighted down until the glue dries. 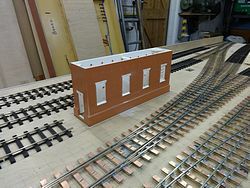 In the meantime, another member of the group has made a start on the new signal box, the brick base for which is seen in its proposed position at the station throat. 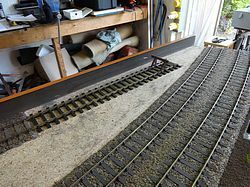 The final picture shows the current state of play with all the sleepers strips laid and the first of the stock rails for the scissors crossover soldered in place. 7th December 2015: The Limit of Shunt sign is pictured here in place for the first time since completion. This was at the very successful and enjoyable Warley Model Railway Show 2015. 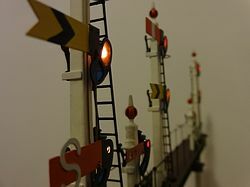 The new signalling brought into use recently at the completion of Phase 1, gratifyingly received many favourable comments and interest. We hope to start Phase 2, the final phase of the station rebuild imminently. Phase 1 has involved a huge amount of work behind the scenes such as planning, design and wiring the interlocking. In terms of visible changes seen by visitors, there is only one new baseboard and two new signal gantries following the completion of Phase 1. Although this has absolutely transformed this middle section of the layout, we hope the biggest transformation will be the renewal of the station itself during Phase 2. With the next 4 new baseboards already built, and with a huge amount of ‘behind the scenes’ work already complete, we hope this second phase will be achieved more quickly than the first despite the fact it will appear to visitors as 4 times the amount of work! Watch this space for track laying to recommence! 24th November 2015: The first two pictures show the outline of the mounting hole for the new Limit of Shunt sign marked out on the existing scenery and then the baseplate in position with the embankment cut back. The next two pictures show the bank shaped around the hole with new gravel glued around the foot of the bank and then the grass made good with green scatter material. Underneath the baseboard a clamp bracket and a contact spring for the feed to the lamp has been fitted. 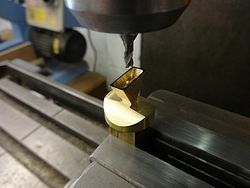 The large nut retains the sign in position by means of the threaded spindle on the underside of the base plate. This is similar in principle to the method we use for mounting signals. 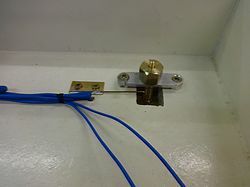 A wire connection to the contact spring provides the feed for the lighting circuit and the clamp bracket provides the return via the baseplate and the ladder, again as per the method used to light our signals. 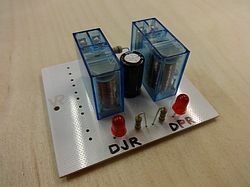 A small voltage regulating power supply has been made to feed the Limit of Shunt sign separately in preference to taking power from the main signal lighting circuit. This is to allow the voltage applied to the lamp in the sign to be adjusted independently for the best visual effect. 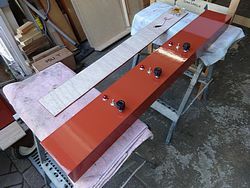 The next picture shows the lamp casing mounted on a piece of scrap wood while it was spray painted black prior to assembly. 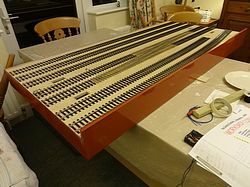 The final two pictures show the completed Limit of Shunt fully assembled. All that remains to be done is the gravel on the base plate needs to be painted to match that already in place on the layout. 6th November 2015: After much deliberation over how to go about it we have now made the components for the Limit of Shunt. 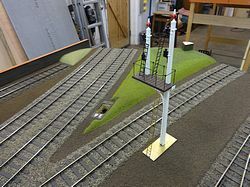 The tapered wooden post has been made in the same way as the signal posts. 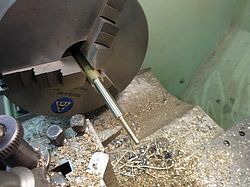 A lamp bracket has been milled from brass and the lamp casing itself has been turned on the lathe to match the lamp castings used on the signals. 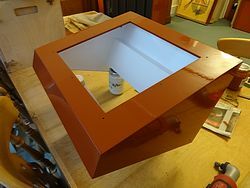 The tapered light box for the illuminated stencil called for some delicate machining on the mill. 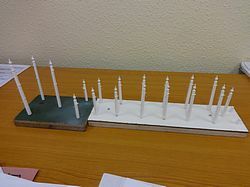 The second picture shows the components assembled prior to painting. 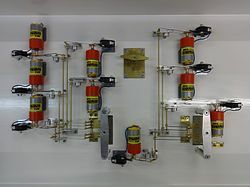 The reason for making everything out of brass is now apparent as it allows all the components to be soldered together to form one robust unit. 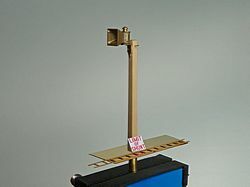 The post is mounted on a baseplate in the same manner as the signals to facilitate removal for when the layout is transported. 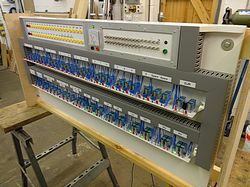 20th October 2015: The faceplate for the Circle Control Panel Train Describer has now been wired and installed together with the associated relays and multi way plug connectors. The second picture shows the front of the face plate mounted in the panel. Once again both control panels have been set up together and the Train Describer fully tested. With this work completed, Phase 1 of the station renewal project is ready for its first exhibition outing to the Beckenham and West Wickham show this weekend (Saturday 24th October 2015). For more information about this show see the Forthcoming Shows tab. Finally, attention has now turned momentarily to a smaller job before we start on Phase 2 of the project with more track laying in the main station throat. 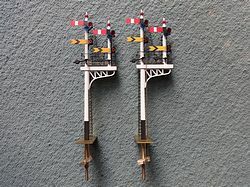 We need a Great Western Limit of Shunt sign on the Down Main line for shunt moves proceeding behind 80/81 Signals (see close up view of panel in blog entry for 8th March 2015). We will also need some Great Western Stop Signs for Phase 2. 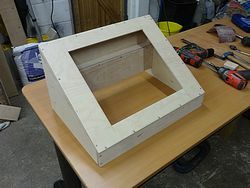 So far a mock up of each has been produced to get the sizes looking right (we have no prototype drawings to work from). They are also helping us work out how we are actually going to make (and illuminate!) the final versions. 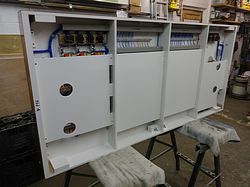 15th September 2015: Cover boards to protect the relays and other equipment on the two recently rewired baseboards have been painted and fitted. The second picture is a close up view of some of the stowage pockets for the jumper cables. 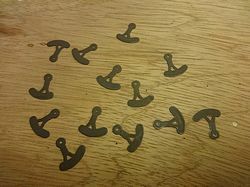 The multi-way plug connectors are stowed in the pockets to protect the pins from damage. The cables themselves are protected by spiral wrap and held in place for transport by Terry clips. 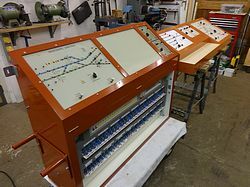 Pictures 3 and 4 show the faceplate for the Train Describers for the new station control console has been assembled and wired up. 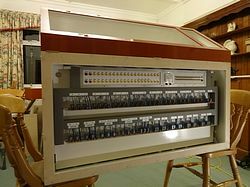 The associated relays and wiring have been mounted inside the interlocking cabinet. They are actually mounted on the backboard behind the double sided relay interlocking board (see earlier blog entries) which has been pivoted out of the way for this picture. Picture 6 shows the Train Describer faceplate mounted in the aperture at the right hand end of the control console. 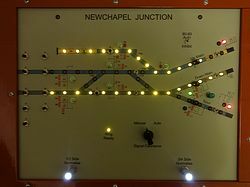 In this view the steady Yellow light on the upper instrument for the Main Lines shows that a Vans train has been accepted. 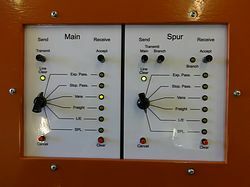 The lower instrument for the Spur line shows an Express Passenger train has been offered to and accepted by the operator on the circle control panel. 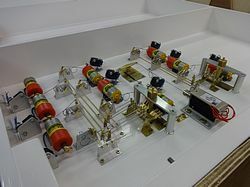 The train was offered by selecting the type of train with the rotary switch and pressing the Transmit button. This caused the corresponding train description light at the other end to flash Yellow. When the operator there accepted the train, his indication went to steady Yellow and the Green “Line Clear” light at this, the sending end, was illuminated. As with the existing Train Describers, a “Line Clear” has to be obtained in order to allow the signals for departing trains to be cleared. 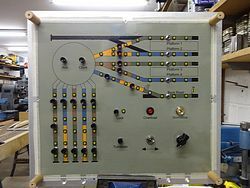 Picture 7 shows the two control panels erected together for testing of the new Train Describers with the existing ones in the Circle Control panel. 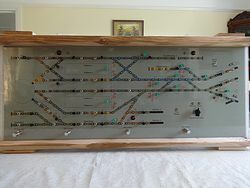 Since all this work has been completed with time to spare before our next exhibition in Beckenham in October, we have decided to also renew the Train Describer panel in the Circle Control Panel now. After 25 years in service some of the buttons were becoming unreliable so it was always intended that we would do this renewal as and when it could be fitted in between other work. This is a like for like renewal and the opportunity will also be taken to replace the relay circuit boards. So far, the new faceplate has been completed and components mounted. 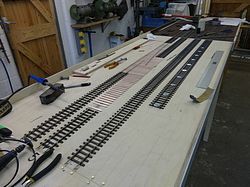 1st July 2015: The first picture shows further wiring being carried out on the existing baseboard that is being fully rewired (this is the board that carries the existing facing crossover and the connections to the short carriage siding). The second picture shows this wiring has been completed. 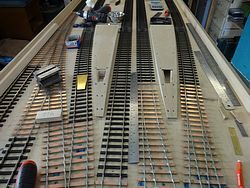 The next two pictures show extensive wiring changes in progress and finally completed on the second existing baseboard – this is the board with the junction between the double track main line and the single track spur. 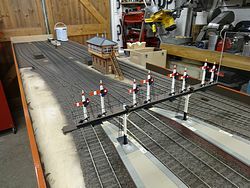 The existing main station boards together with the new board (with the two new signal gantries and the new trailing crossover), the two rewired boards and finally the two legs of the triangular junction were recently erected for testing. 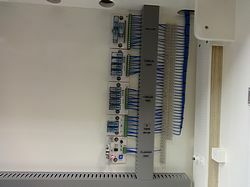 Picture 6 shows the new interlocking cabinet and control console in place to the right of the existing main station control panel which will remain in use until the new station is built. 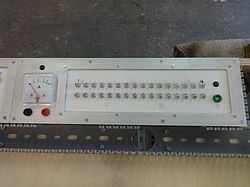 The old control panel will then be abolished and control transferred to the new control console at which point a new full size panel faceplate will be fitted to replace the temporary panel faceplate. 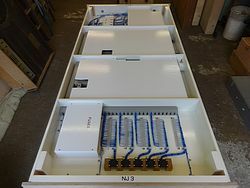 The final three pictures were taken whilst thorough testing was carried out to ensure that all the functions controlled by the new temporary panel and the interfaces with the existing panel work correctly. 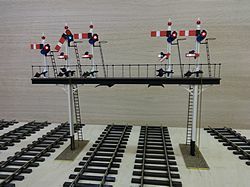 The two mainline crossovers, the short carriage siding, the triangular junction, the two new signal gantries as well as the outer Home signals are now all operated via the interlocking which also selects and connects the correct track feed sections to the correct controller. We are pleased to report that it all worked correctly first time! 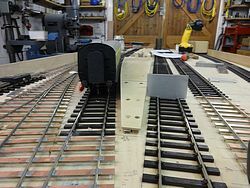 13th May 2015: With a gap between shows from May to September, work has started on the changes that need to be made to existing baseboards to enable the interlocking and temporary control panel to be brought into use. 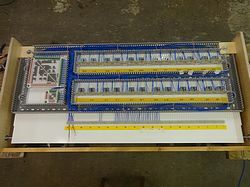 The first picture shows the board that needs to be completely re-wired before the equipment and wiring was removed. 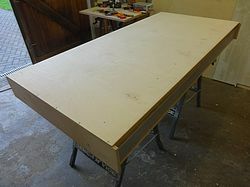 The next picture shows the bare board with filling of holes and repainting underway. The final picture shows painting finished and some of the existing components refitted. 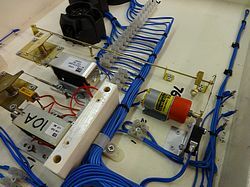 The new printed circuit boards are also all in place and a start has been made on the wiring. 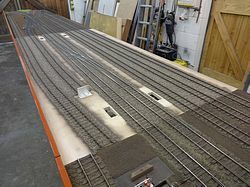 29th April 2015: The new baseboard was recently set up with the existing station boards and successfully tested with the interlocking and temporary control panel. 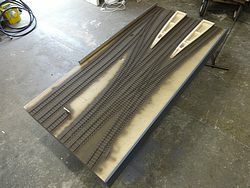 The second picture shows the track ballasted and ready for painting. 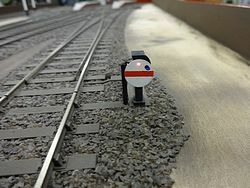 A sleeper built buffer stop has been made for the end of the short carriage siding. 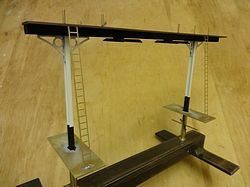 The substantial metal bracket is designed to stop a runaway train demolishing the signal gantry. The fourth picture shows the buffer stop in place over the bracket. 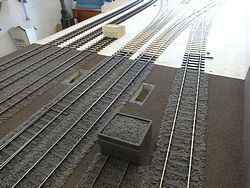 The fifth picture shows the ballast in the sidings has been weathered to match the track on the existing baseboards. 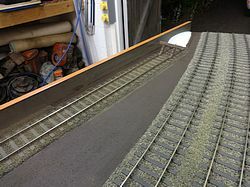 The next picture shows weathering of the ballast on the main running lines has been completed and the finer grained ballast in the wideways has been started. 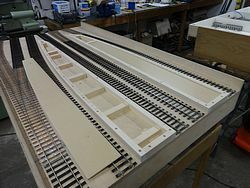 Application and painting of the wideway ballast is now complete which means this baseboard is now finished and ready for use. 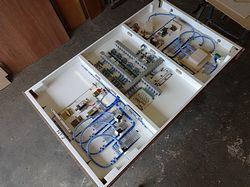 With lots more wiring design and PCB production complete, it is our plan, after the Shepton Mallet show on 2nd and 3rd May, to start major wiring alterations on two of the existing boards. One board requires fully rewiring from scratch, and the other requires major alterations. 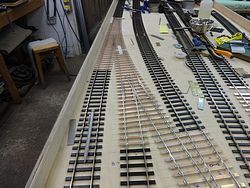 The wiring changes to these boards are necessary to enable them to be controlled by the new interlocking. With the whole of the summer free from shows, this will give us enough time to complete this work and allow us to bring the new board and signal gantries into use in time for our shows this autumn. 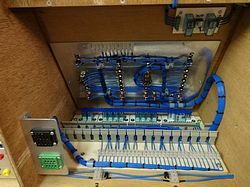 8th March 2015: The wiring which was previously terminated onto terminal blocks on a temporary strip of wood in the bottom of the interlocking cabinet have now been connected to the terminals on the bottom of the interlocking rack. 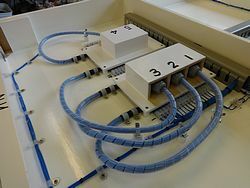 The first picture is a close-up view of the double block connector arrangement which allows the interlocking rack to be disconnected and removed from the cabinet for maintenance or modifications if required in the future. The second picture shows the interlocking rack in the lowered position to allow access to the relays etc. on the rear, whilst the third picture shows the rack almost in the upright position. 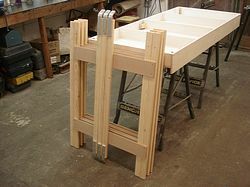 The fourth picture shows the interlocking rack bolted in its normal, fully upright, position. 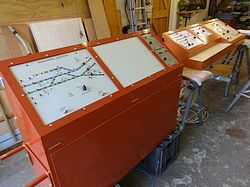 The interlocking cabinet is now fully painted and the control console has been refitted. A temporary control panel has been made and fitted into the control console. A temporary blanking panel fills the remainder of the large aperture. As mentioned previously, the small aperture on the right hand end of the console will accommodate the train describer instruments in due course. 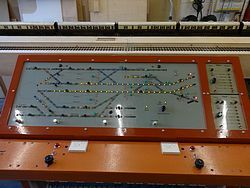 This temporary control panel has been built to enable the interlocking to be brought into use at the same time as the new baseboard is commissioned and will control the new crossover and the two new signal gantries as well as the Outer Home signals and the junction between the Spur and the Main line. The existing main station will continue to be controlled from the existing panel in this interim phase. 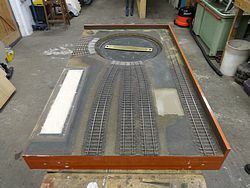 The final panel (which will additionally control the new station) will fill the large aperture and will be built when the new station boards are nearing completion. 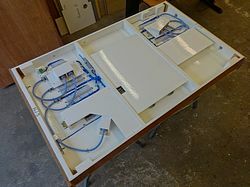 We estimate the required life of the temporary panel to be up to two years. 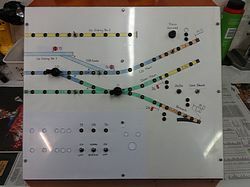 The sixth picture is a close up of the temporary panel faceplate showing two routes set – one from the Up main into the Siding and the other from the Down Main towards the main station. 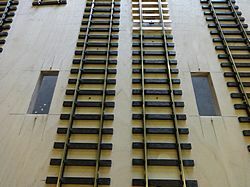 The black push buttons (“E” to “Z”) are the route setting buttons and a route is set by first pressing the button at the entrance to the route and then the button at the exit – for example, the route into the siding was set by pressing button “X” and then button “S”. The green buttons are for manual signal clearance if required – the Signal Clearance switch will normally be in the Auto position and the appropriate signal(s) will clear automatically when a route is set. 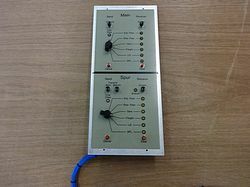 Track section toggle switches are provided for fault isolation purposes only and will normally be left in the On position - the interlocking selects the appropriate track sections and connects them to the relevant controller when a route is set. The Normalise buttons at the bottom of the panel are used to cancel routes after the train movement has been completed. The “1/2” button applies to routes to or from platforms 1 or 2 in the main station and the “3/4” button to routes to or from platforms 3 or 4 or the goods loop behind platform 4. The final two pictures show progress with the new baseboard. 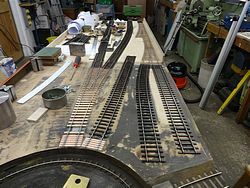 The protective cover boards previously made and painted have now been fixed in place on the underside and a base colour of sleeper grime has been sprayed on the track which is now ready for ballasting. 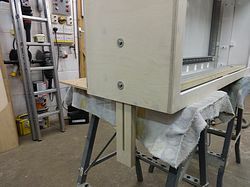 16th February 2015: The legs for the interlocking cabinet have been made and installed. When not in use they slide up into the cabinet. 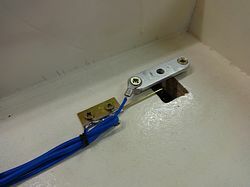 They are clamped in the raised or lowered position by means of the two bolts seen in the end of the cabinet. 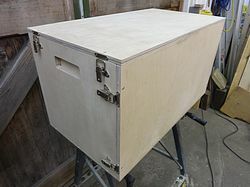 The second picture shows the interlocking cabinet has been painted internally and a start made on mounting the equipment. 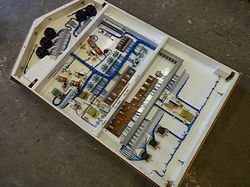 At the top are an ammeter and a pair of 15v power outlet sockets together with the first of a number of circuit fuse boards. 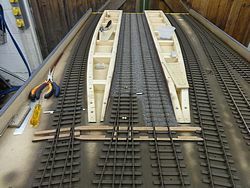 Below these can be seen the terminal strips from which flying leads with plug couplers will connect the interlocking to the layout. On the other side of the backboard is the 20Amp 15 Volt switch mode power supply which will power the interlocking and the control console. 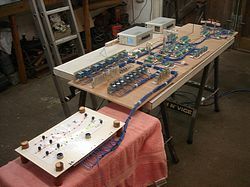 The terminals seen at the bottom are temporarily mounted on a piece of scrap wood while the wires are being terminated. 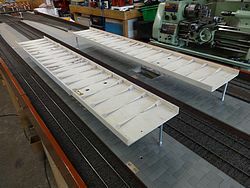 These terminals will later be transferred onto the bottom of the double sided interlocking rack which was prepared previously. 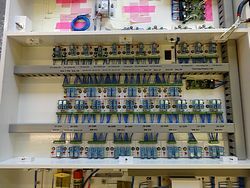 The fourth and fifth pictures show the remainder of the fuse boards have been installed and wiring is well under way. 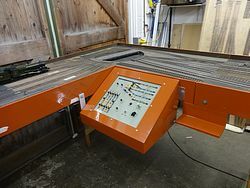 The next two pictures show the control console has been painted inside and out and a pair of cooling fans fitted. These will draw air up through the interlocking cabinet to keep all the equipment inside cool. The warm air will be vented from the rear of the console. 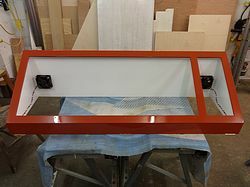 Meanwhile the new baseboard which carries the two signal gantries has been painted and is now ready for scenic treatment to commence. 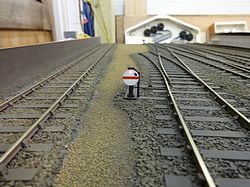 6th January 2015: Cover boards to protect the relays and signal and point operating equipment under the new baseboard have now been made and painting is in progress. 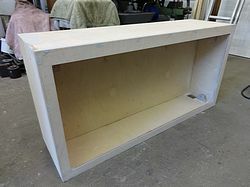 The cabinet for the new control console has been built and mounted on top of the previously-built interlocking cabinet. 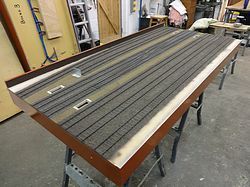 The large cutout on the left is for the push button panel faceplate and the smaller one to the right will accommodate the train describer equipment. 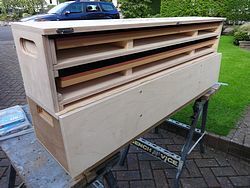 The timber packings seen in the photo will be replaced in due course by proper legs to set the whole assembly at the required height. 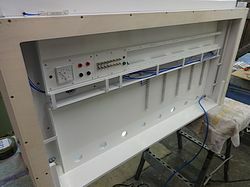 The control console cabinet is hinged along the front edge to allow access to panel wiring inside. 9th December 2014: The wiring has been fully completed on this first board. 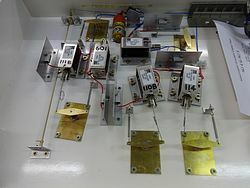 As seen in the first picture, the plug couplers have been mounted and wired, and as seen in the second picture, labels have been added to identify the relay units. 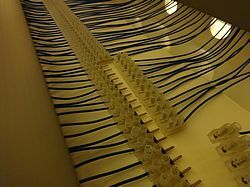 The last picture shows a view of the finished underside of the board, which contains 2 point solenoids, 18 signal motors, 39 printed circuit boards, 65 relays and 270 metres of wire! 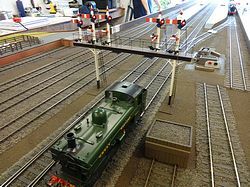 Having also installed a very small amount of temporary wiring to work the signals, we are now looking forward to demonstrating the signals on this new board at the Model Engineer Exhibition at Sandown Park Racecourse in Esher on the 12-14th December 2014. 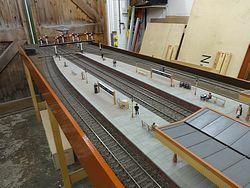 30th November 2014: A cover board to protect the track etc. during storage and transport to and from shows has been made. 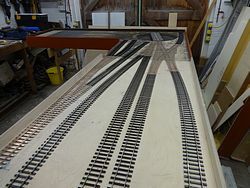 Since this is one of the boards that abuts the goods yard boards, there is no side rail above the baseboard surface on one side. 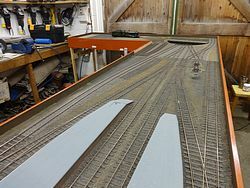 In order to prevent the cover board being pressed down when the board is stacked with others, a plywood strip has been fixed on the underside to bear down on the rails of the line nearest the camera in the second photo. 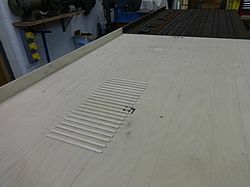 The third picture shows a close up view of the plywood strip which is spaced accurately from the underside of the cover board resting on the rails. 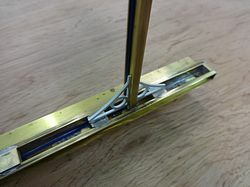 This method has been used before on some of the existing baseboards and by distributing the weight evenly throughout the length of the baseboard has proved to be very effective. 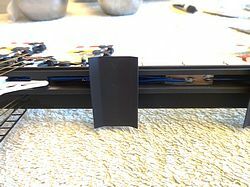 The aluminium strip along the side of the board helps replace some of the stiffness lost by removing the top section of side rail. 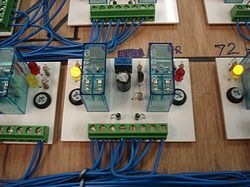 Following completion of the installation of the signal operating mechanisms, all the relay units required on this board have now been made. 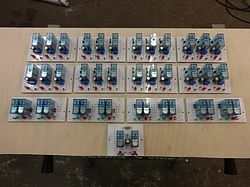 These will be used to control the signal mechanisms, operate points and select the various track feeds as required when setting routes with the push button interlocking. 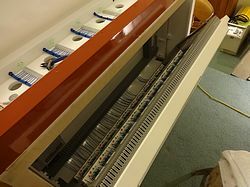 The fifth picture shows the relay units and cable ducting in place on the underside of the baseboard soon after the wiring had been started. 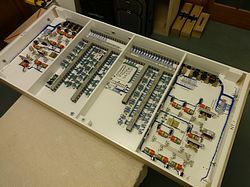 The sixth picture shows most of the wiring to the relay units has now been completed. 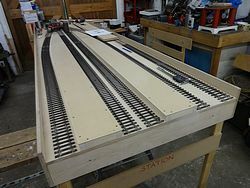 Still to be added are the connectors for jumper cables to adjacent boards and the wiring to the track. 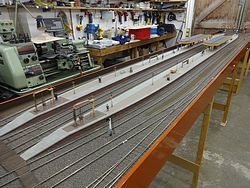 Finally, a start has been made on the wiring to the track. As per our usual practice, we provide a feed to every section of rail; we do not rely on fishplates to conduct. This means there has to be a wire dropper soldered to each piece of rail. 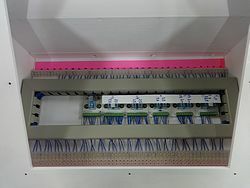 These pass just through to the underside of the baseboard where wires are soldered onto the protruding tails and then run to the various relay boards and terminals as required. 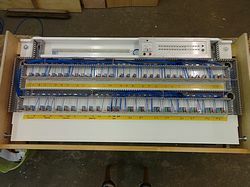 On this baseboard alone there are 42 track droppers! It is a lot of work but absolutely essential for reliable running. 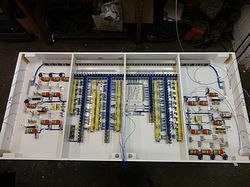 Now that we are within a few days of completing all the wiring on this board, we are pleased to confirm that we will take this board, along with the two new portal signal gantries, to the Model Engineer Exhibition at Sandown Park Racecourse in Esher on the 12-14th December 2014. 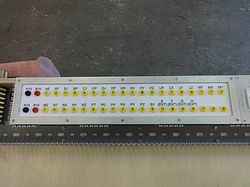 This board will form a separate side exhibit to the main layout, and will demonstrate the model engineering involved in the operation of the new signals and crossover points. 5th November 2014: The first two pictures show the completed operating mechanisms for the Advanced Starter signal gantry. 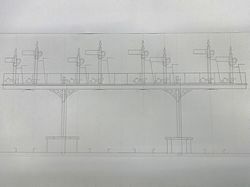 Much time was expended in the design of the layout for the individual drives to enable six arms to be driven via one of the gantry uprights and three via the other. 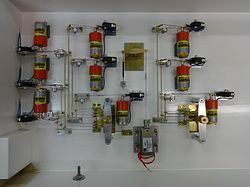 Also seen is the point operating mechanism and solenoid for one end of the crossover between the main lines. When energised, the solenoid retracts and pulls the crank to reverse the points. To normalise the points, the supply to the solenoid is removed, and the spring returns the crank to its normal position. The third picture shows all the arms on the Advanced Starter gantry in the Off position during final adjustment of the drives. 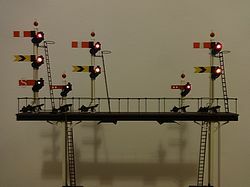 This is a sight that will not be seen when the signals are being controlled by the interlocking!! 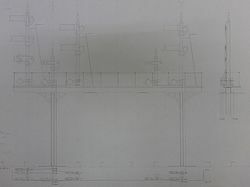 The fourth picture shows the completed operating mechanisms for the Inner Home gantry. This time there are five arms driven via one upright and four via the other. The drive crank for the other end of the crossover can also be seen – the operating solenoid and return spring have been added since this photo was taken. The fifth picture shows all the arms in the Off position for final drive adjustments. 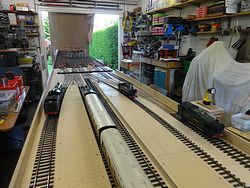 The final picture is (almost) a driver’s eye view of the Inner Home gantry as seen on the approach under the Advance Starters. 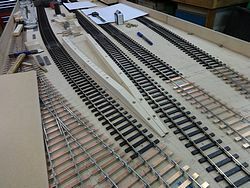 16th October 2014: Components for the operating mechanisms/linkages for the first three signal arms have been made and assembled. Once again slow acting mechanisms have been provided. The principle of operation is the same as those previously provided for the Outer Home signals (see Blog entry for 29th September 2013). 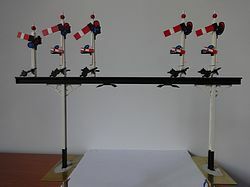 However, due to the need to operate up to six arms via each gantry upright, it has been necessary to modify the design slightly to allow for remote mounting of the motors. The first two pictures show general views of the new arrangement. 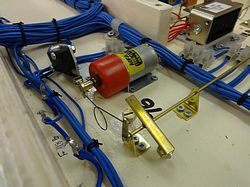 Control of the limit of travel is now achieved by an adjustable eccentric stop acting on a crank arm mounted on the rotary drive shaft on the opposite side of the mounting bracket to the wire omega loop/drive crank. 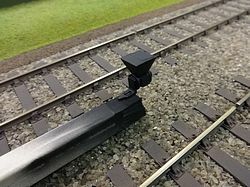 It is only necessary to provide a stop in the signal Off position – any over travel of the drive mechanism in the signal On position merely results in a clearance gap between the operating crank and the operating lever mounted on the signal post mounting spindle. Having finalised all the dimensions, we can now go into mass production of sufficient parts for the remaining 6 arms on this first gantry, and the other 9 arms on the second gantry. 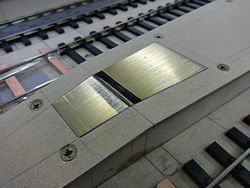 The third picture shows the contact spring which will provide the feed for the signal lamps via the small piece of printed circuit board on the underside of one of the signal gantry mounting plates. 16th September 2014: The first picture shows the second portal gantry carrying the Inner Home signals has now been completed. Construction of the third and final portal gantry (platform Starter signals) will not be undertaken until track laying and final platform alignment has been completed. This is because the clearances at the platform ends are very tight and spacing of the upright girders/sizing of the base plates could be critical. 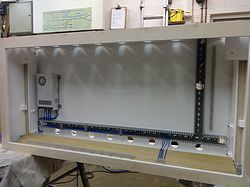 A new transport box to carry all the new signals for the station renewal project has been built. 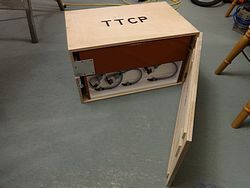 The second picture shows the base of the box with resilient rubber mounts which are designed to hold the signals securely in place and absorb transport shocks. 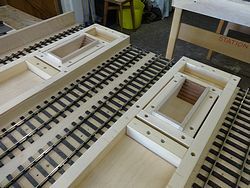 The third picture shows the box laying on its back to allow the mounting spindles of the signals to be put through the resilient mounts. 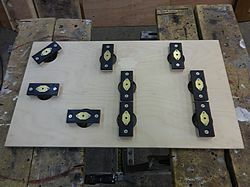 The holes in the bottom of the box allow the retaining nuts to be screwed by hand onto the bottom of the mounting spindles as seen in the fourth picture. 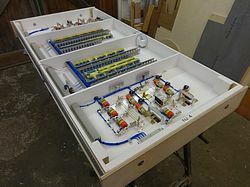 The fifth picture shows the completed box (minus its removable top and front panels) loaded with the signals constructed so far. 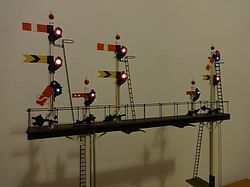 The pair of mounts to the front left are for the third gantry and the single mount on the right is for a possible straight post signal with mechanical route indicator for moves from the carriage siding into the front two platforms (the jury is still out as to whether a main signal or shunting disc will be provided for these moves). 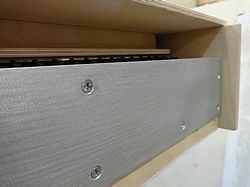 The final picture of the completed box shows the front and top panels held in place by robust locating pins and buckle catches. Meanwhile excellent progress has been made with the interlocking. 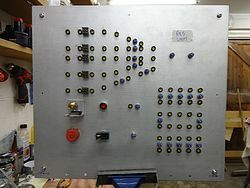 The final two pictures show the relay units, diode matrices, frig panel and fuse board have all been finally mounted on both sides of the board. 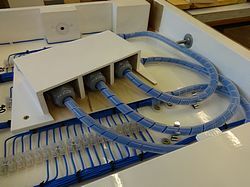 All the inter-board wiring has been completed with the wires concealed in plastic ducting for a neat finish without the need for lacing the wires together. The interlocking has been thoroughly tested by means of a temporary test panel – and it all works! 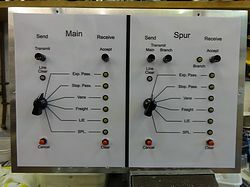 Screws connected by wire to the relevant inputs to the interlocking represent the route setting buttons. 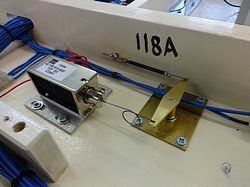 A wander lead is used to “dab” a feed voltage onto the relevant screws to simulate the button operations required to set routes. 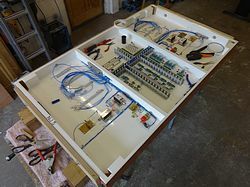 Whilst the heart of the interlocking is now complete there is still much work to be done in provision of power supplies and cable terminations for the interfaces between the interlocking and the control panel and the layout boards. 21st August 2014: With another exhibition over, work has continued with both the signal gantry and the interlocking. 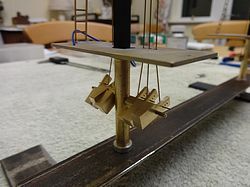 The first photo shows the lower brass wires from the balance weights to the operating cranks have been formed and fitted. 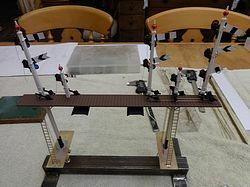 At the same time of their fitting, the gantry has been permanently assembled by gluing the dolls and soldering the signal arms, cranks and balance weights in place. The handrail uprights have also been glued in place, and the lighting wires to each doll are partly run. 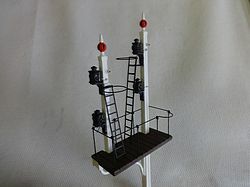 In addition to this, detailing such as the ladders, and scenic ballast have been added to the bases of the signal. 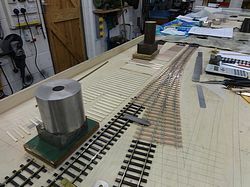 The second photo shows further progress where the doll feed wires have been terminated to the main feed wire, the signal arm bump stops have been made, fitted and adjusted, and the handrail horizontal has been soldered in place. The last two photos show that the interlocking board has been painted white and the components refitted. 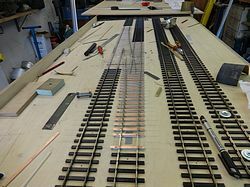 Wiring is now approximately 50% complete on this interlocking board. 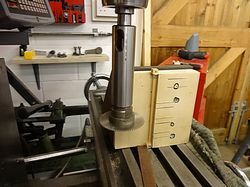 13th July 2014: Sufficient operating cranks for this gantry and the platform starter gantry have been turned up on the lathe and milled to profile. 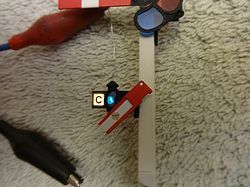 The remaining lamp units for the Calling On arms have been made and painted and the illuminated stencils added as per the example seen in the second picture. 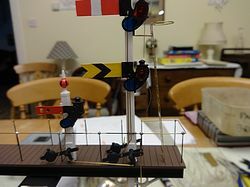 The third picture shows the black paintwork on the main structure has been completed and all the lamp units have been fitted to the dolls. 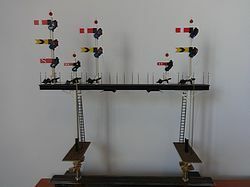 The operating wires between the signal arms and the balance weight levers have been made up from brass wire and are shown temporarily in place together with the signal arms and dolls. 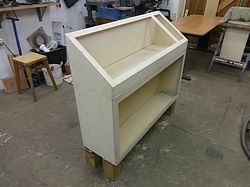 Meanwhile construction of the interlocking cabinet has started as seen in the fourth picture. 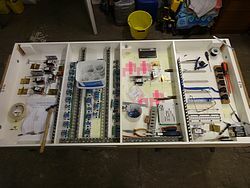 The bracket visible in the bottom right corner is a pivot point for a hinged backboard which will carry the relay units. 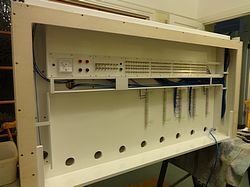 The back of the cabinet itself will be full of cable terminations. 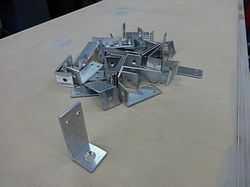 50 brackets for mounting the relay units on the hinged backboard have been made up from aluminium angle. 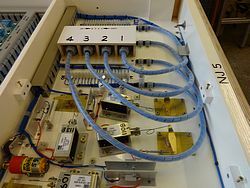 The sixth picture shows the layout of the relay units and cable ducts etc. on the hinged backboard has been finalised and these are shown temporarily in place before removal for painting of the cabinet. 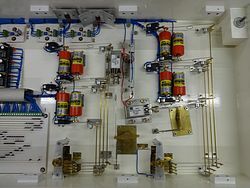 The seventh picture is a close up of the “frig panel”. The purpose of this is a contingency measure in the event of a failure of the interlocking at a show and, as we have gone to the trouble of providing this facility, we hope it will never actually be needed! 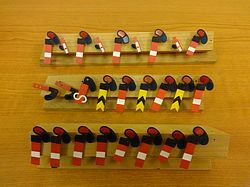 Each of the yellow sockets “AE”, “AF” etc. will allow individual routes to be called manually by plugging in a patch lead. 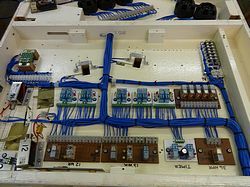 The final picture shows the fuse board. 12th June 2014: Work is progressing well with the second of the three portal signal gantries. 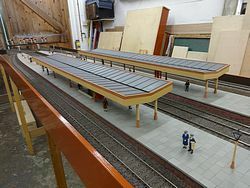 This was designed back in December and will carry the Inner Home arms controlling access to the station platforms and freight arrivals road as seen in the first picture. The second picture shows that all of the main structural brass work has been assembled, primed and painted white ready for the black paint. 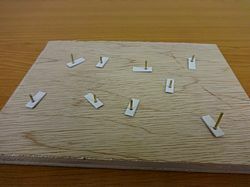 The third picture shows the mounting holes have been cut in the baseboard and locating pins fitted. 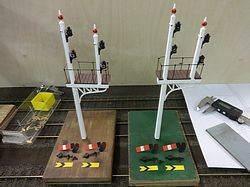 The fourth picture shows the gantry in position with the previously made dolls temporarily in place and the fifth picture shows where this new gantry is positioned in relation to the Advance Starter gantry previously completed. 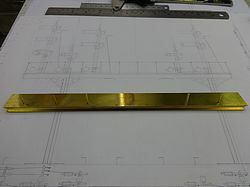 The first of four special lamp units required for the subsidiary Call On arms under each of the main arms reading into the platforms (see picture 1) has been machined from brass block, primed and painted. The lamp case chimney has been machined from brass rod to match the standard lamp castings used elsewhere. 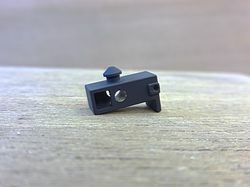 The small hole on the right hand end of the casing is the signal arm pivot bearing, the larger round hole to the left provides illumination for the signal arm spectacles whilst the square hole is for an illuminated stencil “C” which is revealed when the signal arm is in the Off position. 8th May 2014: The first gantry is finally finished! The first picture shows the hand rail has been completed. 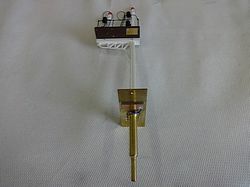 The return wires from each of the lamps have been soldered to the ladders or the handrail as convenient. 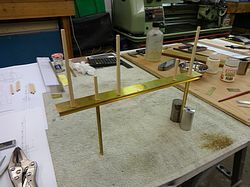 The ladders and hand rail are soldered to the brass structure to form the negative earth return for the lamps. The next three pictures show various combinations of signal arms in the On and Off positions. The fifth picture is a close up view of a pair of backlights. These are achieved by painting the back of the lamps with black paint leaving a small aperture in the centre. Note the lower signal arm is in the On position and the back light is visible. 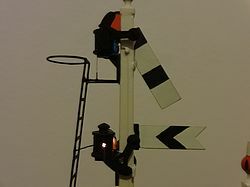 The upper arm is in the Off position and the back light is masked by the back blind which is attached to the rear of the signal arm spindle. The next picture is a general view from the rear of the gantry showing all the back lights. 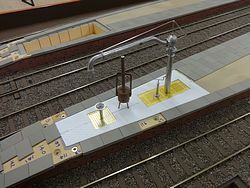 The final picture is a detail view showing how the signal arms are mounted as close as possible to the lamp castings – this ensures that minimal light is visible from the side. One portal gantry down, two more to go! 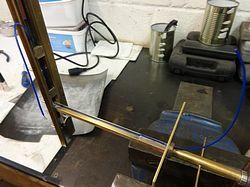 1st May 2014: A small jig/former has been made to facilitate consistent and accurate manufacture from fine brass wire of the supporting brackets for the ladders on the dolls. 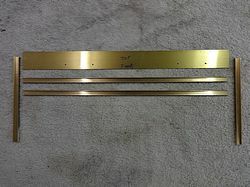 The second picture shows the offset shape of a formed bracket. 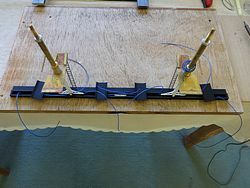 The third picture shows the brackets soldered to each of the doll ladders together with safety hoops which are also formed from the same wire. 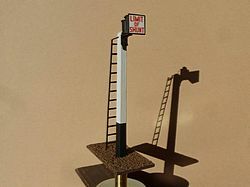 The fourth picture is a close up view of the top of one of the ladders showing how the bracket is positioned on the doll just under the lamp bracket casting and the fifth shows the same ladder viewed from the front. 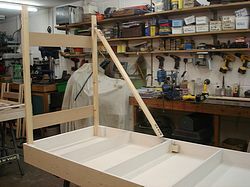 The final picture shows all three ladders rested in place before painting and final fitting. 14th April 2014: Final assembly of the gantry has now started. The first two pictures show scenic scatter has been applied to the mounting plates. 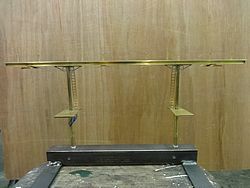 Also the handrail uprights which are made from 0.5mm brass wire have been fitted. 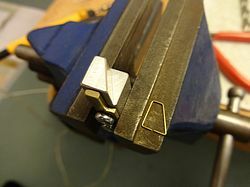 The third picture shows how loops have been formed in the hand rail uprights using a fine pair of round nosed pliers. Note they have been part painted before fitting; the tops will remain unpainted until the handrail itself has been soldered in place. 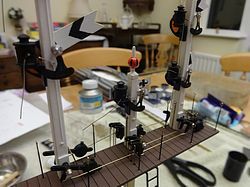 All five dolls have been glued in place and the signal arms, operating wires and cranks fitted as seen in the fourth picture. 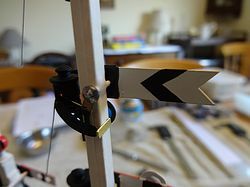 The fourth and fifth photos show back blinds have been soldered to the rear of the signal arm pivots and retaining caps have been soldered onto the operating crank and balance weight shafts. 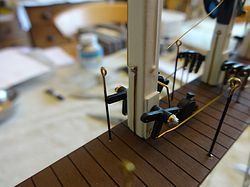 As seen in the sixth photo, the positive lamp feed wires which come up through the decking have been soldered to the short wires which were previously drilled diagonally through the dolls. 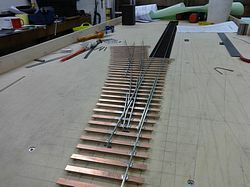 Underneath the decking, as seen in the seventh photo, these wires are connected to the piece of PCB previously glued in place and connected to the positive feed wire originating from under one of the plates at the base of the gantry. Finally photo eight shows that small pieces of brass plate have been glued to the dolls to act as bump stops on the back blinds. This stops each arm in the ON position when the arms return under gravity. The last photo shows all the arms accurately in the ON position. 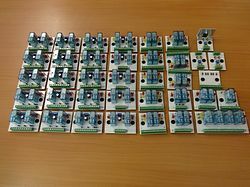 20th March 2014: All 32 printed circuit boards (containing 103 relays and over 500 diodes!) required for the interlocking have been finished. 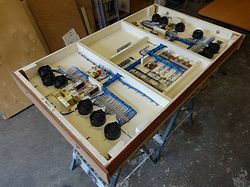 Detailed wiring design for the interlocking is nearing completion and that for the control panel is finished. 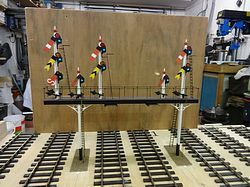 Meanwhile further progress has been made with the signal gantry. 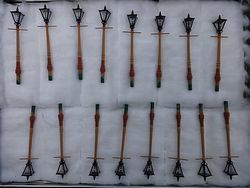 The second picture shows that lamps have been fitted into the lamp castings and one lead of each has been soldered to the feed wire and pins on the rear of each doll. 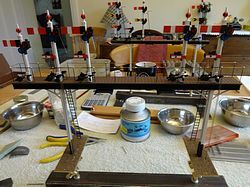 A considerable amount of time has been spent bending some quite complicated shapes in 0.5mm brass wire to form the linkages between the arms, balance weights, and cranks as seen in the third and fourth pictures. Note the dolls and arms etc. are only temporarily in place and the arms are at strange angles because bump stops to limit the travel have yet to be added. The operating linkages pass through the base plates to operating levers/balance weights. 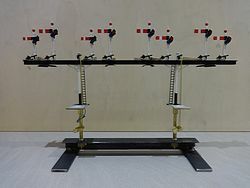 Note that additional weight has been provided here to overcome the inertia of the longer more complicated linkages to ensure the arms reliably restore to the On position. 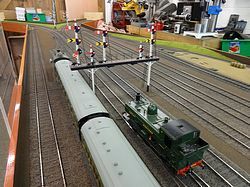 Finally, the layout is packed up again ready to appear at the London Festival of Railway Modelling at Alexandra Palace on 22nd-23rd March 2014. 18th February 2014: The first two pictures show the wooden decking has now been glued onto the structure and brass ladders soldered in place. 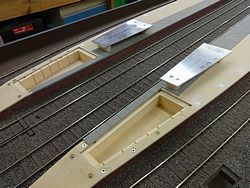 The third picture shows the gantry temporarily in place over the two mounting holes which have been cut in the baseboard surface. 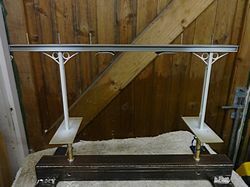 The next three pictures show the first batch of operating cranks has been machined from brass and painted, the first batch of back blinds has been painted and the balance weight levers required for all three gantries have been painted. Lamp castings, which were previously drilled out to accept grain of wheat bulbs and painted, have been fitted to the dolls. Final assembly will commence soon but in the meantime, the layout is being packed up ready to go to Brighton Modelworld for the weekend 21-23rd February. 3rd February 2014: After masking, the upper girder work and smoke deflectors have been sprayed black as seen in the first picture. 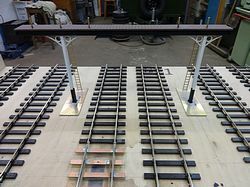 The second picture shows all of the etched brass signal arms required for all three gantries have been assembled and painted. The spectacles have also been glazed with coloured gels. The third picture shows the dolls and arms temporarily placed in position to give an impression of what the finished structure will look like. 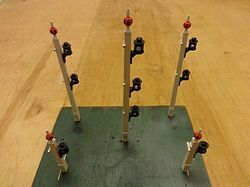 Picture four shows the finials on all the dolls have been painted red and black and the balance weight pivot plates have been glued on. 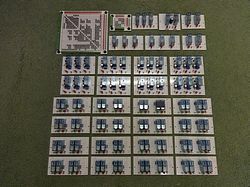 Whilst construction of the gantry has been progressing, design of the production versions of the various printed circuit boards required for the interlocking has been finalised. 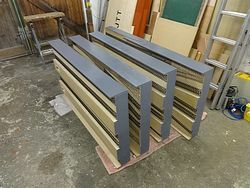 These are now being batch produced and a selection of the boards completed so far can been seen in the fifth picture with close-ups of three different types in the last three pictures. 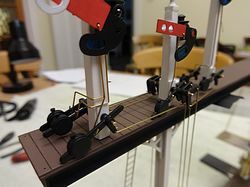 19th January 2014: The balance weight pivots which will be located near the bottom of each doll, cannot be made by the usual method of inserting a pin through the wood because they would be fouled by the doll mounting pins which protrude from the gantry deck. 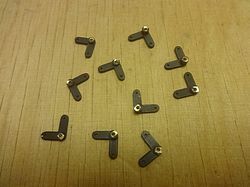 The first picture shows special pivots have been made by soldering short lengths of brass wire into small brass plates. 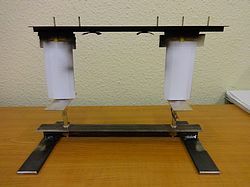 Note the length of the wire varies depending on the number of balance weights to be accommodated. 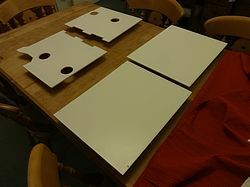 The pivot plates required for all three gantries have been primed and painted white ready for gluing onto the dolls. 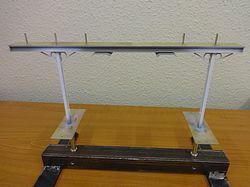 The second and third pictures show how the main feed wire for the signal lamps has been glued to the inside angle of one of the girder uprights to help conceal it once painted. The wire passes through a hole which was (very!) carefully drilled through the flange at the top of the mounting spindle and will be soldered in due course to a piece of printed circuit board on the underside of the mounting plate. 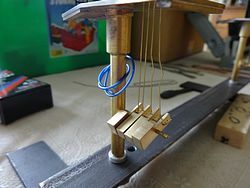 The fourth picture shows white metal supporting brackets being glued with Araldite to the girder uprights and small brass blocks soldered between the cross girders. 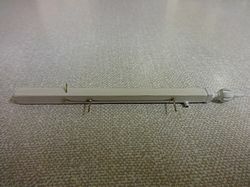 This picture also shows how the lamp feed wire is hidden between the cross girders. 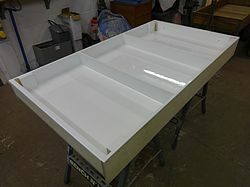 The final picture shows smoke deflectors have also been added and the structure has been primed and painted white. 9th January 2014: Over Christmas work has continued on the signal gantries. 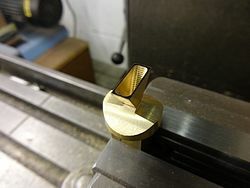 Signal arm pivot tubes have been Araldited into the slots previously machined into the dolls and a whitemetal finial added to each, an example of which is shown in the first picture. 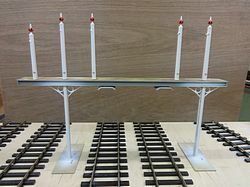 After a coat of primer, pins have been inserted into the rear of the dolls and connected by fine wire to provide termination points for the feed to the signal lamps. 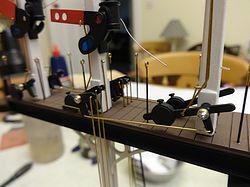 Note the lower pin which goes diagonally through the doll to allow the feed wire to come up through the decking of the gantry at the side of the doll. 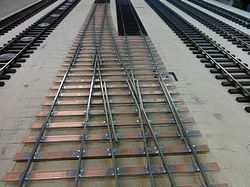 This is necessary to allow the wiring to be concealed behind the cross girders. 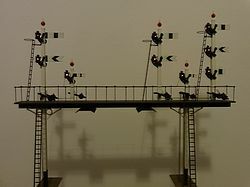 The third picture shows all of the dolls required for the three gantries have been assembled to this stage and painted white. 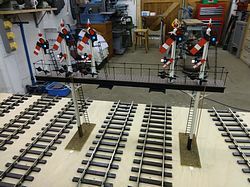 In a similar fashion to the other signals on the layout, each of the gantry uprights have to be fixed to a mounting plate and spindle to allow the signals to be removed whilst the layout is in storage or being transported to shows. 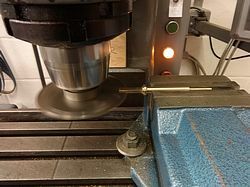 The fourth picture shows a mounting spindle being turned in the lathe and the fifth shows a slot being cut into the top part of the spindle. The two completed mounting spindles for the first gantry can be seen in picture six. 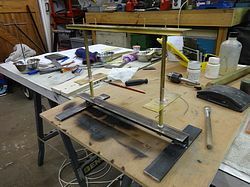 The slotted portion at the top of each spindle will protrude through a mounting plate and be soldered to the gantry girder uprights. 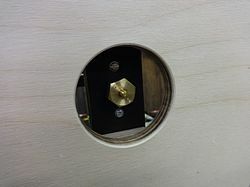 The hole drilled through the lower portion of each stem is for a pivot wire to carry the signal operating cranks whilst the threaded portion at the bottom is for a retaining nut which will secure the completed structure to brackets under the baseboard. 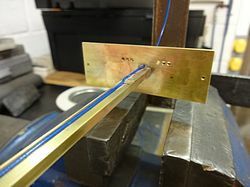 The seventh picture shows one of the mounting plates being drilled to allow the signal operating wires to pass down through the plate to the operating mechanisms. The larger hole in the centre of the plate is for the mounting spindle. 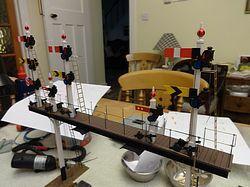 The final picture shows the mounting spindles and base plates soldered to the gantry uprights and the pivot wires for the operating cranks have also been added. Note the steel bracket to which the gantry is secured; this has been made to provide a secure means of holding the structure whilst further work is carried out on it. 27th December 2013: Work has continued on preparing components for the Advance Starter and Inner Home portal gantries. 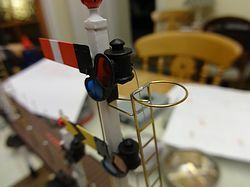 The first picture is a close up of one of the dolls showing the machined slots to carry pivot tubes for the signal arms. 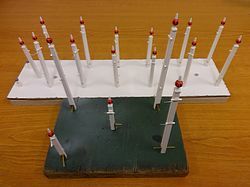 Note that as the doll is tapered the slots are set progressively deeper into the post towards the bottom – this is to maintain the correct spacing between the pivots on the left of the doll and the lamps which will be added later on the right. The second picture shows all of the dolls required for the first two portal gantries. The holes in the bottom of the dolls are for locating pins to attach them to the decking. 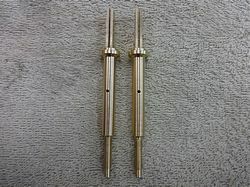 A batch of 20 pins which have been machined from brass rod can be seen in the third picture. 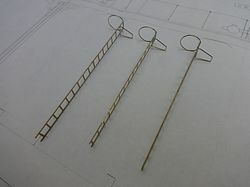 The fourth picture shows the main components for the uprights, cross girders and decking for the Advance Starter gantry have been cut to size from brass section and plate. 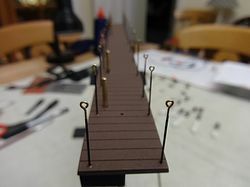 The decking has been drilled to accept the doll locating pins and handrail uprights. 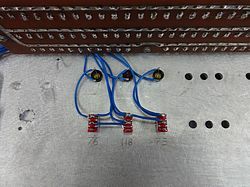 The fifth picture shows the locating pins soldered into place. 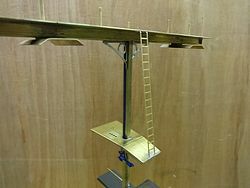 The final picture shows the main structure for the Advance Starter gantry is complete and awaiting detail parts such as brackets and smoke deflectors etc. to be added. The dolls have been temporarily placed on the pins for the photo. 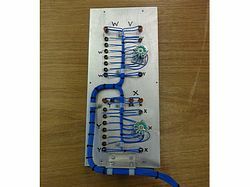 3rd December 2013: With a busy spell of shows out the way, wiring design is progressing well enabling the production of the first 2 printed circuit boards (PCBs) seen in the first photo. 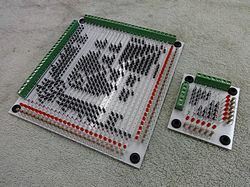 These first 2 PCBs we are calling ‘diode matrix boards’ as they are a matrix of diodes providing logic control to the wiring circuits. 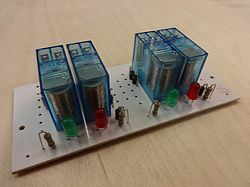 There will be many more diode matrix boards, together with many other relay units. These 2 boards photographed will provide the interlocking for the route setting, thereby only allowing the operator to set up valid routes that do not conflict with other routes already set. The new station and wiring will allow up to 3 non-conflicting routes to be set at once. 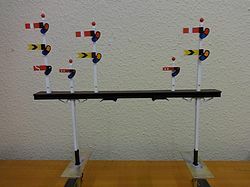 On a separate line of work, a lot of thought has been put to the 3 remaining portal signal gantries that need making. These portal gantries are bigger and far more complex structures than the 2 gantries previously installed. The first 2 portal gantries, the advanced starter, and the inner home have been designed and can be seen in the second and third photos respectively. The third portal gantry is about 90% designed, thus allowing the manufacturing of components for the first 2 portal gantries to commence. 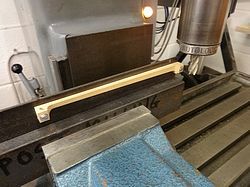 The fourth photo shows the milling of a tapered wooden doll, the fifth photo shows all the dolls machined for the first 2 gantries, and the last photo shows slits being machined into the posts. 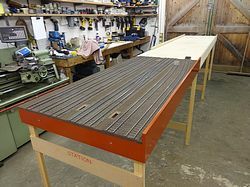 These slits will accurately receive the bearing tubes for the signal arms. 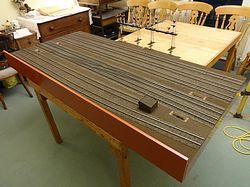 7th September 2013: The brass signal bases have been finished off with a layer of brown ballast. 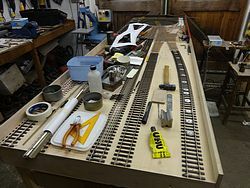 The long process of wiring and printed circuit board design continues as we are now preparing to load the railway once again for our next spell of exhibitions, 3 shows in just 4 weeks! 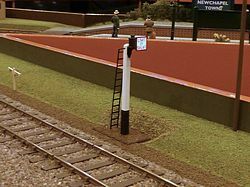 29th September 2013: In this gap between exhibitions, it has been decided to commission the two new signal gantries in order to reduce the amount of work required later. 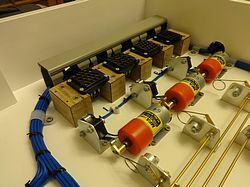 The first Photo shows the old signal motors and relay units have been recovered, while the second photo shows the new relay units in position and wired up. The third and fourth photos show the new slow-acting motors with their associated linkage to operate the signals. In the third photo, the signal is in position. 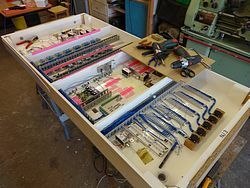 Photos five and six show two of the arms operated by the new motors, and the last photo shows the section of the layout set up for testing after the extensive amount of new wiring carried out. 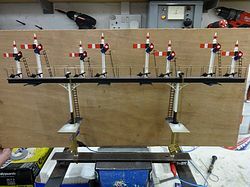 3rd September 2013: While more wiring design has been going on in the background, together with the development and design of further circuit boards, the first two gantry signals have now been completed. 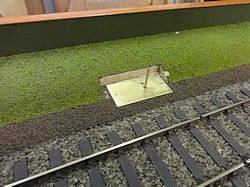 The second photo shows the insulated pad glued to the underside of the brass signal base. 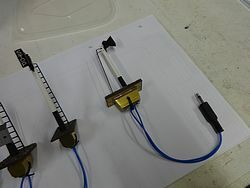 When the sprung contact makes connection to this pad, this completes the positive circuit for the lighting which is fed to each lamp using a very thin strand of wire stretched up the back of the posts. 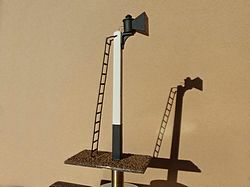 The negative return for each lamp is connected to the brass handrails and ladders which are connected to the brass base via the main ladder. 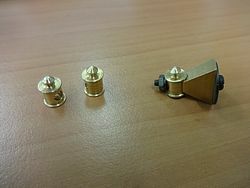 This provides the negative earth return through the mounting clamp which locates on the threaded part of the brass base. 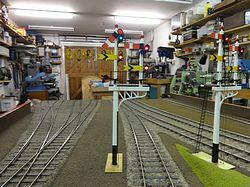 The third and fourth photos show one of the new lower quadrant signals in its future position on the existing layout. 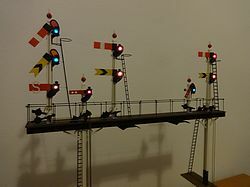 The other matching signal will go directly beside this one. 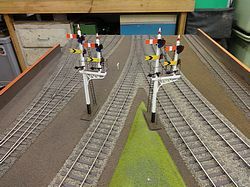 The current signals which are only single arm upper quadrant, will be taken out of service and kept as spares for the rest of the layout which will remain upper quadrant signalled. 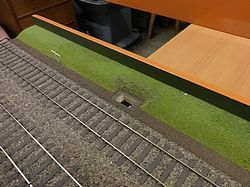 The fifth photo shows the completed signals, while the sixth photo shows the grass bank has been finished on the baseboard. 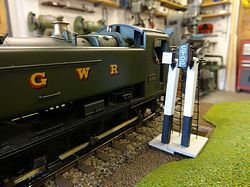 The layout has now been loaded in preparation for this weekend’s exhibition at the Gauge O Guild Exhibition in Telford where the new siding and shunt signals can be seen in use for the first time. 1st August 2013: The two shunt signals seen in the first 3 photos have been finished and the two gantry signals are progressing well. 23th July 2013: As can be seen in the first 3 photos, the track ballast has been placed and glued with the usual solution of watered-down wood glue and a couple of drops of washing up liquid to reduce the surface tension of the glue solution. This ballast has been spray painted to match the colours of the existing ballast. 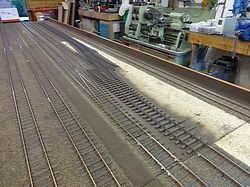 Also seen in the first few photos, the wide-ways have been ballasted using a much finer brown ballast. 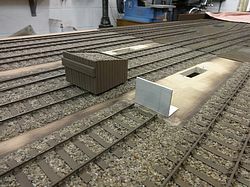 The colour of this brown ballast will be darkened further to match the existing. The third, fourth and fifth photos show that the shunt signals for the new siding are well underway. 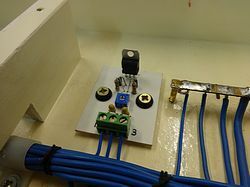 The shunt signal bodies have been milled from brass solid and the drive motor, drive cranks, drive rod and micro switch have been installed for the first signal. Incidentally, the signal motor that was put on test back in February (see 27th February) has now completed over 432 000 cycles (completing 1 cycle every 30 seconds day and night continuously). Although there is slack developing in the bearings this is still going strong and has somewhat passed the figure of 50 000 cycles that we looking for in order to obtain a 20 year lifespan in use on the layout. With 432 000 cycles, this will now give an estimated lifespan in use on the layout of 180 years! Nothing is better than using industrial components. Following the successful performance of this new signal drive design, we are therefore using it to drive all the new signals. The final 2 photos show a start has been made to the first 2 new signal gantries. These 2 gantries, which are identical, will replace the existing outer home signals for the new station. 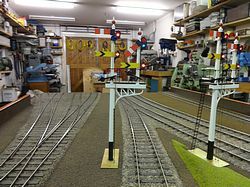 These signals will be built and kept safe in preparation for the complete rewire of this end of the layout at which point they will be installed and commissioned. 10th July 2013: The first photo shows the new connection and trap point for the new siding have been laid. Eventually this siding will connect onto the new baseboard that will replace the furthest board in this photo. 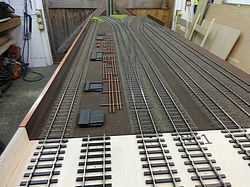 Originally it was planned to leave this new connection out of use until the major re-wire of this end of the layout was done, however after looking at the wiring diagrams and making use of spare cabling and some spare relay units, we have been able to bring this new connection into use early with minimal work. As a result we have extended this siding onto the existing board as seen in the first photo. The front siding has also been extended to maximise its length as seen in the second and third photos. 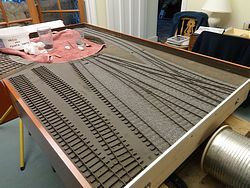 With the phase 1 track laying complete, photo 4 shows the new track has been sprayed with a basecoat of track dirt colour and is now ready for ballasting. 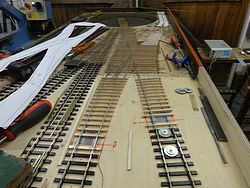 In order to bring the new siding into use, the point operating solenoids and linkage has been fitted (photo 5) together with temporary alteration patches on the control panel. 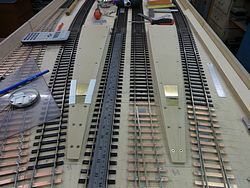 The new siding is shown towards the top of the panel and 3 temporary switches at the bottom operate the crossover and the two shunt signals which will be installed soon. 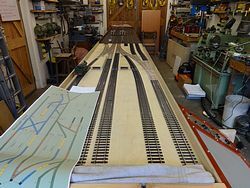 19th June 2013: With the rest of the layout now packed away after the very enjoyable Chatham model railway exhibition last weekend, our attention has returned to the remaining track laying for phase 1. This will involve laying the new connection and trap point that will connect to the siding on the new board. The last photo shows the p-way scenery has been removed in preparation for this work. Also the front siding will be extended into the grass bank by about 8 inches in order to maximise its length. A close up of this siding is shown in the third photo. 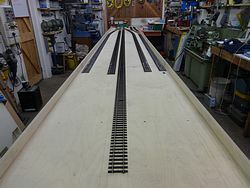 3rd June 2013: The track laying on the first of the new boards is complete. 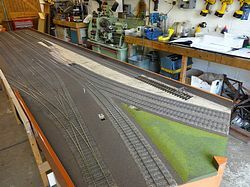 All that is required now to complete the track laying for phase 1 of the project is to lay the connection to the short siding on the left of the board in the fourth photo. This connection will be located directly beside the crossover on the existing board seen in the photos. 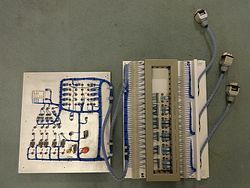 As this connection will be affecting an existing board still in use at exhibitions, this work will have to be fitted in-between exhibitions to maintain a working layout. 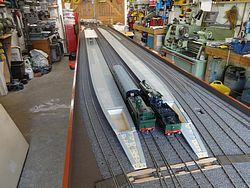 With our next exhibition on 15th and 16th June at the Medway Park Leisure Centre in Gillingham, our attentions have now turned to preparing and loading the layout in preparation for this show. 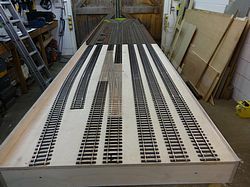 13th May 2013: All the balsawood sleepers have been glued for the crossover together with the copper-clad sleepers on top. 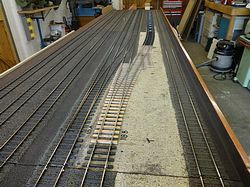 A start has been made on the plain-line track, and the first few rails forming the crossover have been laid and soldered. 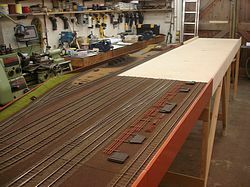 6th May 2013: Together with more detailed wiring design, all 5 boards have been gloss painted underneath and work has now started on laying track! 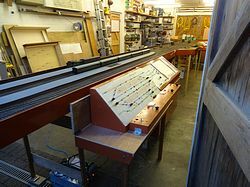 The second photo shows the first step which was to set up the new boards along with the existing boards they join to at each end. 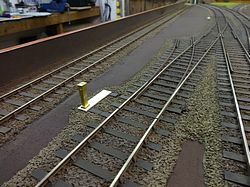 Then, using a string line, reference points were marked accurately on the new boards from which track can be laid. One problem we do face throughout this project is that we must keep a working layout for all the exhibitions in our diary over the next couple of years. Therefore after much consideration and planning, it has been decided to split the job into 2 halves and commission them separately. 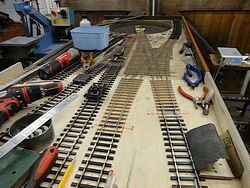 Phase 1 will be the end furthest from the turntable, which will consist of the first new board and a track modification to the existing adjoining board. Together with this there will be the major job of designing and building the new entrance-exit interlocking circuitry and building a temporary panel to control phase 1 of the new station. 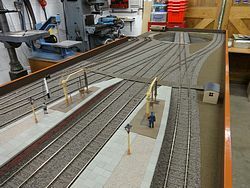 Also to enable this end of the layout to be controlled by the new entrance-exit interlocking, 4 of the existing boards near the circle will need totally rewiring. Phase 1 is no small job and will have to be carefully stage-worked between exhibitions to ensure the layout is fully operational for all our exhibitions. 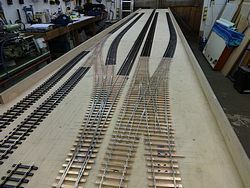 The good news is that phase 2 of the job (the half closest to the turntable), despite being the majority of the new track work, should be easier to commission as there is less fringe design with the existing boards and the entrance-exit interlocking will have already been built and thus will be ready and waiting to be brought into use. So with the stage works planned, phase 1 track laying has commenced. 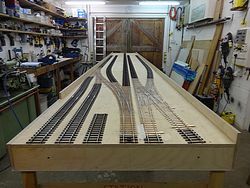 The new track layout has been marked on the first new board and the first of the underlying balsawood sleepers have been glued for the crossover. 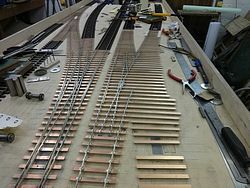 Copper-clad sleepers will then be glued on top of the balsawood. 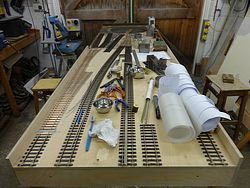 Together with this, brass screws have been positioned at the ends of the board in readiness for soldering to the rail to give support at the rail ends. 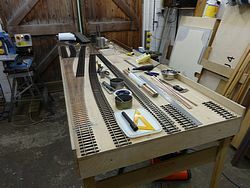 21st April 2013: The new boards have been assembled to the existing goods yard. This involved reducing the height of the side rail on the new boards where the goods yard attaches. 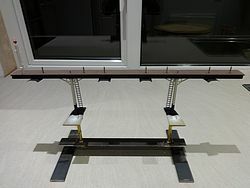 The loss in strength from reducing the height of the side rail has been regained by fitting a strip of 3mm thick aluminium plate to the outside of the reduced side rail. 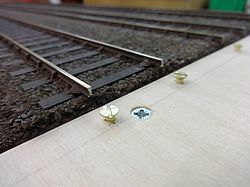 All necessary bolt holes to secure the goods yard have been drilled. 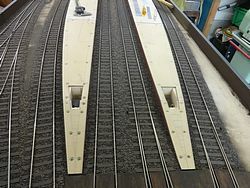 The last photo shows the new track plan laid in position on these first two boards. Meanwhile painting the underneath of the boards is progressing well. 24th March 2013: As seen in the first photo, the end of the boards have been fitted with blocks to form leg sockets. The second photo shows a leg in position with a diagonal brace fitted. 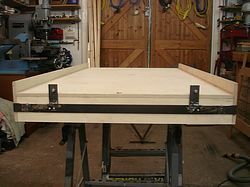 The brace is bolted to the bottom of the leg and at the top is fastened to a threaded stud secured rigidly to the board in a block of wood. A close up of this is shown in the third photo. 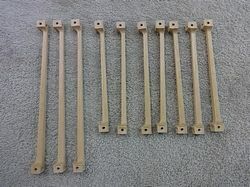 The fourth photo shows the finished 3 diagonal braces and the 6 legs. Out of the 5 new boards, board 5 which is the first to be erected has 2 legs, the rest have just 1 leg whilst the other end hangs off the previous board. 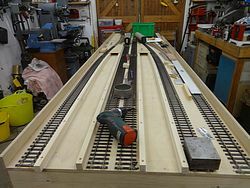 The fifth photo shows the board drilling jig that has been modified from earlier use on the newly built Branch Line Terminus. 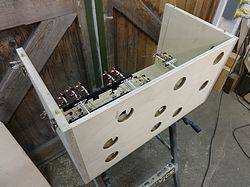 Once all the holes were jig-drilled, the 5 boards were assembled and unite together for the first time. Also note that the underneath of the boards have received their first coat of undercoat. 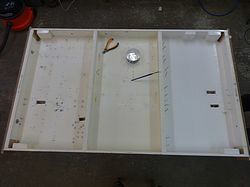 We always paint the underneath of the boards in gloss white as it not only gives a neater finish, but it also makes it easier when marking out the position of equipment and improves light levels when wiring up. 14th March 2013: All 5 baseboards have been built. Note that the longer 5’ 1” boards have an additional cross member to improve rigidity. 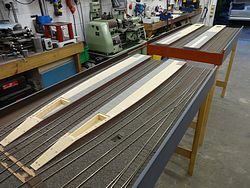 3rd March 2013: The first photo shows the intermediate cross members have been produced along with all the side rails required for the new boards. 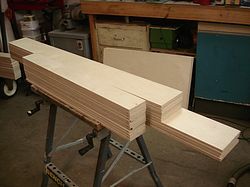 These again are cut to length as and when the boards are built. 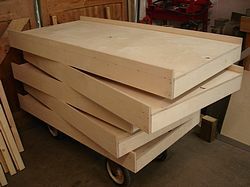 In total there will be three new 4’ 4” boards and two 5’ 1” boards. 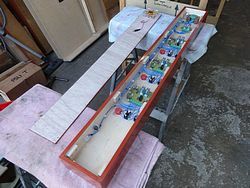 The next two photos show construction of the first board, and the last photo shows the first 2 boards complete. The board upside-down shows the intermediate cross members. 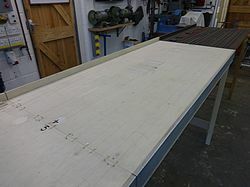 27th February 2013: Construction of the new station has officially started with 5 sheets of 12mm Birch plywood purchased to make the 5 new baseboards. 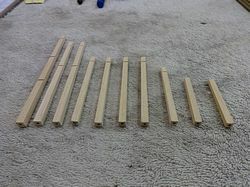 The first photo shows 10 strips of plywood that will form the ends of the new boards. These strips have been made double thickness by gluing 2 sheets of 12mm plywood together. 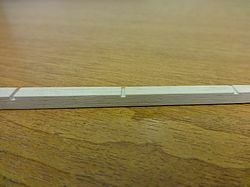 This gives more rigidity at the ends of the boards where they are bolted to each other. 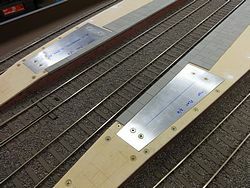 These have been routed along both edges to ensure they are accurate and square, and will be cut to length later when the boards are constructed. 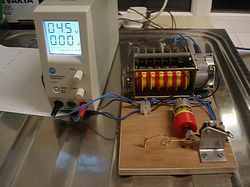 The second photo shows a motor and microswitch on test to prove that these components give reliable operation. 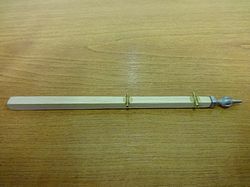 This is the proposed new method of operating the signal arms to give more realistic operation. 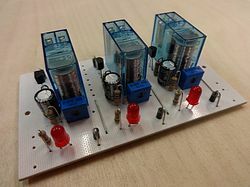 The mechanical timer at the rear of the board is set to drive the motor in the middle one complete revolution every 30 seconds. The 30 second cycle starts by the motor driving 180 degrees where the crank then operates the microswitch and cuts the feed. 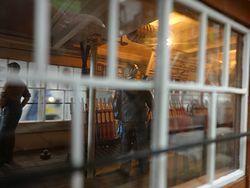 The rotation of the crank also stretches the loops in the brass wire which simulates a signal being driven ‘off’. 15 seconds later the motor then runs the remaining 180 degrees until the microswitch cuts the feed and the signal is then back in the ‘on’ position. 15 seconds later the cycle then starts again. This test cycles the motor and microswitch 2880 times every 24 hours and will be left on test for a suitable length until we are satisfied by its reliability. 27th January 2013: Work has started on the new station project. 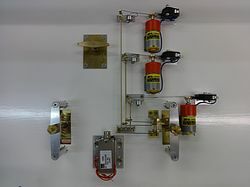 A test rig has been assembled in order to prove that the concept of a route setting panel and relay interlocking is a realistic option and works as intended. 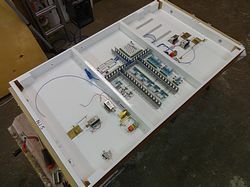 The test rig is in three parts: the push-button panel, which works on the entrance – exit principle; the relay interlocking; and the typical circuits that will be installed under the baseboards to operate signal and point mechanisms. 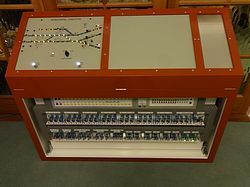 Apart from proving the push-button circuits, interlocking circuits and baseboard circuit designs, this work has also enabled working prototypes of the many complex printed circuit boards to be built and tested before launching into large scale production. For anyone who is worried, the LED colour light signals visible in the second and third photos are just for test rig purposes. 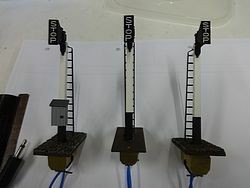 All the signals on the new station will be lower quadrant semaphore! 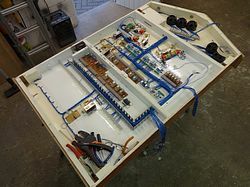 We are pleased to say that after the addition of a few extra diodes to prevent back feeds, the test panel, interlocking and associated baseboard circuits are all working very satisfactorily. 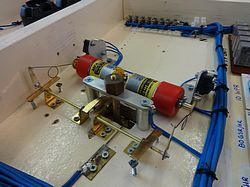 The success of the test rig marks the “go-ahead” for the project, and we hope to start building baseboards in the next couple of months once we are clear of exhibitions. 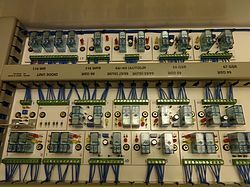 As an indication of the magnitude of this project, the test rig has only 12 routes and requires 72 relays whilst the new station will have 62 routes and nearly 400 relays!